Steel dies aren't the easiest craft supplies to store. They end up unorganized in your drawers or the pieces from your sets become misplaced. This is why the Stamp-n-Storage Magnet Cards were designed just for you! The 5x7 Magnet Cards are made from strong magnets and laminated to sturdy chipboard. Each pack contains 10 Magnet Cards, 2 chipboard dividers and 15 self-adhesive labels. They fit perfectly inside of our Die Totes. You can can even store your 5x7 Magnet Card in a stamp case as seen in our Stamp-n-Die Bundle. A great way to keep your stamps and dies together! Actual size: 4-7/8" x 6-3/4"
Looking for a way to store your Magnet Cards? Check out our Wafer Die Tote. Love using these with the clear pockets to store my dies. Magnets are strong enough to hold all the pieces but not so strong that it’s hard to pick them up. Love every product Stamp and Storage has to offer. And great customer service! These are very well made. Sturdy and strong. Love...love...love them. I have all of my framelits and thinlits attached and organized. Absolutely love them. Having the chip board on the back make them so sturdy. I was able to organize all my thinlets. I cut them down to fit in the folder that my stampinup thinlets come in and they fit perfectly. I will be buying the bigger ones for my Stamp of Life larger dies. These are the best on the market to keep your dies in tact. I have many of these and never disappointed when I get them. A must for those who have dies. By the way this company is top notch. I’m so happy with this product! I am using them to keep my stamps and their specific framelits together within their cases. LOVE THEM!! Great but need one improvement. This is the second batch I have ordered. I like them because they fit nicely into the Stampin up stamp boxes and I can fit the framelits into the matching stamp set. I just wish they came with an adhesive on the back. I have tried to glue them into the box but, this time, they are not sticking. I will try a different glue but a self adhesive backing might be a nice upgrade to an already great product!! Five years ago I ordered 10 5x7 magnet cards and then this year I ordered 40 of the same cards.. I was surprised that the price had only increased $2.00 and the quality is exactly the same. They also fit perfectly in the SU! Co-ordinating stamp case! This makes it so much easier to begin creating the card you envision! An awesome way to keep dies together. I was not sure if these cards would be something I liked or not, so I just bought a few. After trying them out, I'm in LOVE! These are so good. The cards have a strong magnet so my dies stay on without any falling off, they look good and the magnet storage box is perfect for all of my dies and embossing folders. Now that everything is in one place, I'm using my supplies much more often, and crafting just got a whole lot easier. Thank you for such great products. Awesome product! Nice strong magnet and the added chip board on back makes this a superior product! I love them compared to the sheets you can buy and then have to cut. The ones that Stamp=n-storage carries are nice and firm and hold dies well. They fit just right inside the standard cases and it is so nice to keep the stamps with the dies. This truly works and I love them. These cards are so nice. I bought one set, but will be buying more. Thank you for such a great product. I LOVE these magnetic cards. They fit the Stampin’ Up! Stamp cases perfectly. I store my dies with their matching stamp set. Best magnet sheets out there! I am just beginning to start putting my dies on these cards so that I can easily see them and get them grouped and in order. I love that these magnets come in different sizes for everyone to choose from. I'm a Stampin Up demonstrator so I prefer the 5x7; I keep the dies with the stamp sets in the case the stamps come in, that's part of my organizational style. Recently purchased these magnetic cards for my frame kits. They are very sturdy and easily stack on end with provided stickers for labeling and dividers to categorize. Now I can easily see what I have and easily select the one I want. Saves space too in my crafting space. Liked the sheets so much I have ordered another set to keep on standby for when I order more frame kits in the future. I like be these magnet cards for my die cut frames. They work perfectly. this was a re-order since I had only l left in this size...In my opinion they are the best. Recently I mentioned this Company and their products to yet another stampin friend and she will be reviewing their site and products. I love the magnetic strength of your magnet cards. I have tried many other magnets and I find that I like your magnet cards the best. These actually work. All those other magnet ideas don’t. I have tried every magnet system recommended by crafters. Only these magnets are powerful enough to hold dies. Stop buying the junk magnets and get these. Love the magnets for keeping my dies organized. . I've love having the magnet cards to store my dies on!!!! I've reordered many times as my collection grows. I also love the boxes that hold the cards. They are fabulous!!!!!!!!!!! All of my dies come on paper with a strip of sticky tape to hold the dies to the paper. That would be a bother each time I wanted to use it. Magnets solve that problem. I transfer them immediately to my magnet backgrounds as soon as they arrive at the house. Outstanding product I have brought multiple packs. 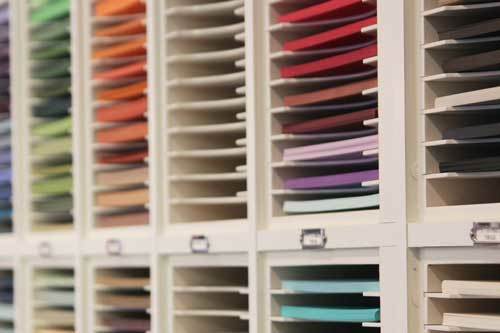 I want to convert all my die storage to magnet sheets - Jennifer McGuire recommended these. It is just so hard to remove the dies from the adhesive on the backings they come on. Magnet sheets make it easy to grab, and easy to return to storage. I haven't actually used these yet, but I do anticipate they will work. These fit in my Stampin' Up! cases perfectly. I keep the stamps & magnetic dies together in the cases & stick the magnetic cards to the back of the case with removable glue dots. Saves having to look for the dies separately from the stamps. I really like that I can keep a set of magnets together on these sturdy sheets. I have a whole lot of these standing up in photo boxes with separators for different types. It helps me easily find what I want. The magnets are strong. What can I say I have bought about 5pgk of these magnetic cards. These cards are the best. I am a Stampin Up demonstrator and I know many others that use these! I love Stamp n Storage and have many of the storage items in my craft room. These are of good quality and just right size for Stampin Up stamp cases. These are wonderful, they hold the dies beautifully. No falling off, always know where my dies are. These magnet sheets are the perfect solution for storing dies! They stay perfectly in place making them easy to select and use. Love these magnetic cards. A great solution for storing metal cutting dies! I have bought many, many packs of this item. It is my go to for all my dies . You can also keep one on your desk to hold your dies as you plan your card or page. LOVE these magnet cards. They really work! I've used other types of magnet sheets and none compare to these. They are a sturdy, stiff board that keeps your die cuts secure. I'm switching over all my diecuts to StampnStorage magnet cards! Highly recommend!!!!! Strong Magnet for storing your framelits. Much better than the super sticky stuff in comes on. I know they will stay in place on these. Couldn't live without them....or I would lose all those little pieces.....it would be nice to have a magnetic bowl to put them in until I'm done with the project.....just an idea!!! SNS has the best quality magnets that I have found after trying other magnet sheets. These magnets are the only ones I use for my thin metal dies. I love these cards. They are sturdy and they fit into my Stampin Up stamp cases. So then everything is together and no more searching for the dies. Thanks for allowing me to be neat and organized. Allows me to know what I need at a glance. This is a time saving product. I have used these for quite some time and I love them! So strong and I never have to worry about losing my dies. Love them! But check your postage, please. I ordered two sets and when they came I had to pay an extra $.57 for the package. Not a big deal, but the rates must have changed. Love these magnetic cards. They fit in my stamps cases so well. So easy to keep stamps and dies together in same box. Nothing keeps thinlits and framelits in place for me as well as these magnet cards do.. The 5 x 7 size fits inside a stamp case, and I love having the stamps and dies stored together. This is a great product. I use the 5x7 magnets cards to hold dies. This size fits perfectly inside the stamp cases from StampinUp so the dies can be stored with the stamp set! They are great!!!! Wonderful!!!!! I love them!!!!! I already have used all of them!!!! Great product!!!! I keep all my ride on these cards. Makes organizing so simple! They were great!!!!! I love them!!!!! I have been using the 5x7 magnetic sheets and love them. A fabulous way to organise your Dies. I’ve tried many brands and been disappointed with the quality. These are the best quality for a reasonable price. I highly recommend this product. I love the 5 x 7 magnet sheets because they fit right inside my plastic cases with my stamp sets. Keeping the metal dies and stamp sets together saves time when working on a project because everything it in one place. Also the magnet sheets are sturdy enough to hold all the dies and they don't fall off. These are super sturdy magnet cards that work great to hold my framelits and thinlits on. I would highly recommend these for organizing these items for my Big Shot. I have been purchasing these magnet sheets for a while. My system is perfectly organized now. While they are current Stampin' Up! framelits,I have them in the Stampnstore wooden storage box. When the framelits and stamp set retire, I transfer the magnet sheet storing my framelits into my stamp set box whether it's wood, clear or photopolymer! Happy Camper!!! I discovered an additional use for these cards. If you use Stampin Up bundle sets, the magnetic card fits inside the stamp case, so you can store the stamp set and the coordinating die in the same case. Organizing dies - never easier. Love the wooden storage boxes to keep die-mounted magnet cards in, too!! The magnet dies are wonderful! It's the best way to store dies. The quality is wonderful also. They are a must buy. I love these magnetic cards for holding dies. They are sturdy and they are the perfect size. I love the cardboard backs so I can write the name of the die and # of pieces. My order arrived quickly! I love all stamp n storage products and recommend your company to others! This is a awesome product. It helps me keep my stamps and dies together. Looking forward to ordering more on payday. Stamp -N- Storage always has Great products. I have many several packages of these. As a Fun Stampers Journey Coach I have a lot of stamps sets with coordinating dies and these magnetic sheets make it so easy to store the dies. I purchased these magnetic cards to help in storing and organizing my thinlit cutting dies and other easy to lose cutting dies. These magnetic cards really do the job well in keeping the dies secure, organized and easy to store. I chose the 5x7 size, but know that any of the sizes depending on need would work just the same. I am sooooooooo happy and satisfied with this Stamp-n-Storage product. I wanted to be able to fit my dies that pertain to a particular Stampin Up stamp set into the stamp case. These are awesome! Perfect fit. For dies that belong to more than one stamp set these will work great when I get the Magnetic Die holder. It's on my list. These are great...I try to keep enough for all of my die sets. So handyand just the right size. These cards fit right in the case with my stamps so I always know where the matching thinlits are for my stamp set. Love them! These are very good quality, heavier than I even expected. Perfect for all of my dies, which were knocking around in a drawer before. They were a great value, too. These magnetic cards are perfect for storing my dies! There is no other product for die storage I'd rather have. I am on my third order of two sets. Love them! Love these magnetic cards because they keep my dies in place ! 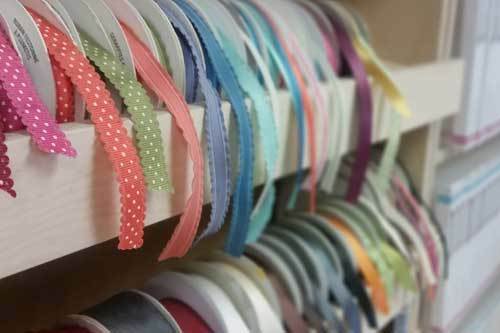 Keeps my craft room so organized too! I store my Stampin' Up thinlit dies on these sheets. The sheet fits nicely in the plastic case the coordinating stamp set comes in. The magnetic pull is strong enough that it holds the dies in place, but not so strong that I break a fingernail prying them off. The best way I've found to store my craft dies, and always a great deal when shopping the site. Great discounts and fast shipping! These cards helped me organize my dies with the coordinating stamp sets saving me space for other products. These magnetic cards are AMAZING! Love these sturdy magnet cards to help me keep my dies organized. I have tried other magnet products but nothing compares to this product. I like to store my stamps and matching dies in the same container. The 5x7 magnet card fits perfectly in the Stampin'Up stamp cases. They are also very sturdy with the cardboard backing and the dies stay put and do not fall off. I have used thinner magnet products and the dies do not adhere very well, falling off even in the case. I have bought these online before and at craft shows and won’t use anything else. They’re sturdy and the magnets are strong enough to hold my dies even though I have the cards standing up in a box. These magnets make organizing my space a breeze. They fit easily into a container and make storage simple. Dues are easily accessible when I use these. I love this product. They kept my dies organized and less prone to losing one. They fit in the same box as the stamps. I know I will love these magnetic cards! I can’t wait until I get enough to organize all my Wafer Dies. Decided to swap out my flimsy magnet sheets for these magnet cards after trying a couple of sizes purchased at a pop-up sale. So worthwhile I won’t use anything else. Nothing drops from the magnetized card ever! Super product. These cards a wonderful for keeping dies on. The magnet holds them tight and it's easy to flip through them to find what I want. I’ve always been satisfied with the purchase of these magnet cards; there the best you can buy. I’ve bought some from other companies before but keep coming back to these from Stamp-n-Storage because no other can compare in quality! Love these cards. They fit in the cases the stamps come in. Can keep the dies with the coordinating stamps. I am so happy i purchased 2 packages of these magnets. These are absolutely the best way to store die sets! I love this product. The magnet cards are so sturdy and the magnetic surface is so much stronger than typical magnet sheets. I highly recommend them to store metal dies. These cards are a must for keeping your framelits and thinlets organized. No more guessing what could be in the pouch they arrived in. I use these all the time to store metal dies and thinlits. Love them. Can't find them anyplace else. I love these magnet cards. I already moved all my dies to the magnets and into the package with the coordinating stamps. I saved so much room and I could reorganize my stamp sets with the extra room. Absolutely the best product for storing dies.They are strong magnets and sturdy cards that keep everything neat and orderly. You don't have to worry about loosing pieces. I love the "stamp n store" organizational products and have yet to be disappointed in anything I have purchased. These magnet cards are wonderful! I ordered two packs of the 5x7 for all of my metal dies and I was able fit complete sets of dies on each card. I only had one set that had one large element that would not fit with all the others and I just put it on the card behind it. I love the 5x7 magnet cards, as they fit perfectly into the Stampin' Up! Cases. I am therefore able to keep both the stamps and matching dies together in the same case. Perfect! As with everything I have purchased from StampnStorage, these do not disappoint. What a wonderful system to securely organize dies! I especially like these for the stacking dies, which can be more difficult to store correctly. I recommend these without hesitation. I love these magnet cards!!! The best magnet card EVER! I have ALL my dies mounted to these strong sturdy magnet cards. The dies stay flat and never fall off so I can store them upright in the wooden bins without losing anything. If you prefer to keep the cards in an envelope they can be easily trimmed with a guillotine to fit. These magnetic cards are a lifesaver when it comes to storing dies. They keep everything neat and orderly and you don't have to worry about losing any pieces. I love the magnet cards I purchased! They are great quality. Nothing falls off. I can store them standing up in a box so I can just flip through to see them all. I only wish I had purchased these sooner as I would have saved money from purchasing other storage options. I will be buying more in the future. Great product! Best way to organize dies and keep from losing them. Good quality magnet better than the cheaper ones available at craft stores/dollar stores. A little pricey but definitely worth it! Will organize all my dies this way. 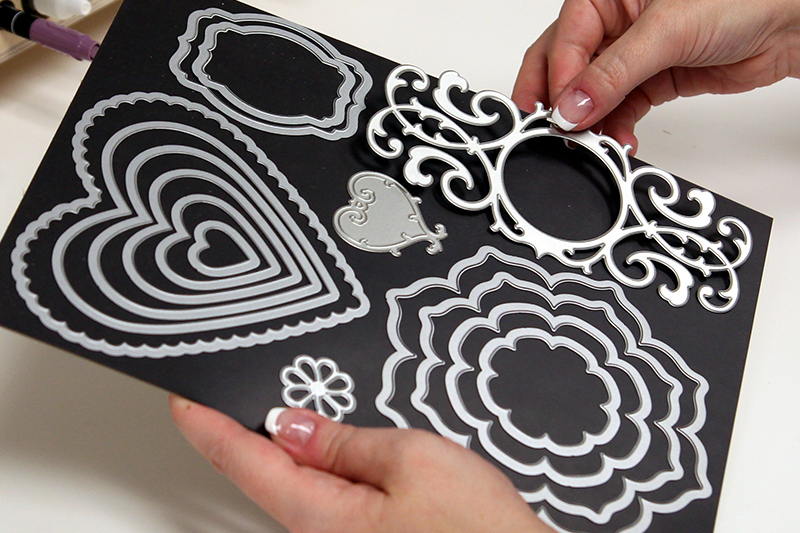 This is perfect for Stampin Up die cuts. Great quality magnet. Easy to access Stampin Up dies. These magnets with dies can easily fit in with the matching stamp sets. I've used these magnet pages for my other dies. Nothing gets lost. What a great investment, I have used several different magnetic sheets and these by far are the best. They are strong and sturdy. I now can't wait to order the Die Totes to store them in. Also I like it that adhesive labels are provided. These cards are high quality and substantial, They are worth their cost! Love them. So convenient to store my die cuts. Thanks for the great product. I love these cards, I have found them to be the best of all that I have tried. No more lost dies! How great is that! I love these cards,. My dies stay firmly in place when I am flipping through them. They do not move, yet you can easily remove them from the cards when you need to use them. I love them. I need to buy a lot more. These are a must have to organize your dies! This is a great product. The size is perfect to put inside the case that homes the matching stamp set. Keeping things together is a must for stampers. Give them a try! I have been using these magnet cards for years and am still addicted! I never seem to have enough! Great for storage and recently I've been taking the sheets to my work station and they are a great way to keep the dies in place while working on a project. No more misplaced tiny dies!!!!!! These magnetic cards are terrific and really easy to use. I bought a pack at a convention in Cincinnati, OH and then ordered 2 packs upon my return home. I received them very quickly. These magnetic die storage cards are indispensable. They hold the dies firmly enough to stay on during storage, but are still easy to remove for use. The way that Stampin Up sends dies makes them very hard to access. The tape that holds them to a piece of thin cardboard makes them hard to remove and leaves a sticky residue that I have to remove with "Goop". I Love these magnetic cards. I use these to store my Stampin' Up! thinlits and framelits inside their plastic case. It makes using the thinlits and framelits so much easier to access and put away. This is perfect for SU cases. Much better than any other magnet I have tried. I can't buy enough of these! I love how they are made! So sturdy! I like that I can easily peruse my wafer dies without having to dump out the plastic sleeve that most popular dies come with. Those plastic sleeves lose my dies, doesn't seem like they would have holes large enough - but the do. The cards display my dies nicely so I can quickly find what I'm looking for. I can take the entire card to my station or I can pick as I go and place back when I'm finished. I started with one pack and quickly went back for two more. I love buying dies knowing that I can care for them the way they should be stored. A great investment! I love to use the 5x7 size in my Stampin' up cases. They fit perfectly in the cases so I put the stamps and dies in the case together. I also have empty cases that I do the same with Stamps of Life stamps and dies. They hold the dies with out worry of falling off. The next size up I use for my go to dies and keep them in a basket right next to my machine. I love these. I can put my dies on them and then in the case with the stamps. That way they are together and I don't misplace either one. These are the best. I purchased magnetic sheets from another company and the dies hardly stuck to them. Not these. The magnetic sheets are strong and sturdy and I need more!! I was so shoot to organize my dies. And these fit perfectly in my Avery envelopes! The function of the magnet cards is everything I hoped for, so much easier to store and use and reposition my dies on these magnet cards. The only complaint I have is that the edges of the chipboard/cardboard are pretty rough. Would be nice if they were clean, smooth edges to help give everything an overall clean look. I have purchased these before. You can never have enough. They are perfect for the thinlits and framelits I purchase from Stampin' Up. I have loved everything I have brought from you. This system is SO COOL....First of all it really works. Second it is easy to organize your wafer thin dies with this. Thirdly, everything is well constructed. Fourthly it really works! Oops! I already said that. I am completely happy with this purchase, Thank you for giving us crafters/scrapbookers/cardmakers products that work! I am very impressed with these cards. I will order more as I need them. These are the best thing for storing your dies. I've put my Stampin' Up dies on these and put them in the boxes with the stamps. No more searching for one or the other. Very convenient. I've put my standalone dies on them too and it makes them easy to find. I have ordered several sets in different sizes. I will NOT use anything else to store my dies, these are the best!! I have been scrap-booking for 20+ years & tried several storage systems that always left me disappointed These are fantastic, they hold the dies securely and make it easy to keep them organized. I would definitely recommend them..
5 x 7 magnet cards are the best!! I am on my 6th set of these magnetic cards and they are the BEST!! THe best part too is the blank inserts that come with them so you can easily divide them!! I won't use any other magnetic cards as these are the best around and SUPER fast delivery!! Tried many and these sturdily backed magnet boards keep the dies on until you take them off. I love the 5x7 size as it fits perfectly into the extra stamp cases sold by Stampin' Up. I keep all my stamps with matching dies in these cases with the 5x7 magnet to hold them securely. Then I have them arranged alphabetically on the terrific shelves from this company. Great products well made. I just ordered 60 of these magnet cards and they're wonderful! I've already labeled them and used 44 of them, saving 16 for future sets I know I'll purchase. Thank you for including labels with them. I, however, used the plastic coated Dymo labels and they stick to them beautifully. I was so excited to FINALLY get my dies organized (I'm a Stampin' Up! Demonstrator so I have LOTS! )I stayed up until I was done with the project at 5:30 in the morning! I had previously used the smaller Stampin' Up! Stamp cases with magnet sheets I'd adhered inside. My problems were: it took up more space than it needed to; some sets are too large for the cases; and the magnets I found were of varying quality. It's no fun finding your dies rattling around the bottom of their box. These are solid and I think they're a great addition to my tool storage. Thank you! I recently purchased 2 sets of the 5 x 7 magnet cards. They are fantastic. I love that they fit inside my Stampin' Up stamp cases so I can keep the stamps and dies together. Cindy who took my order on the phone is always so friendly and helpful. I will be back for more. Have ordered these several times in different sizes over the past couple years and can't do without them. They're better quality and much sturdier than others offered by other companies I had tried and would not buy any others from other companies anymore. I love these magnet cards. These cards have enough power to keep the dies on them without going astray. I have ordered 4 sets of 10 so far. I use my labeler to note each die or die set with it's Brand name, Die name & Item # & number of pieces to each set and I stick these to the back of the magnet card.. It feels good to be organized so I don't order a die twice & I can find the one I need quickly. These magnet cards are worth the price. I have been using the 5 x 7 cards for a couple of years. They fit perfectly inside the Stampin' Up stamp set cases, storing my dies perfectly with the stamps that are bundled with. Love these magnets bought them several times now. It keeps my dies in place. I had previously bought magnet sheets at Michaels and they did not hold my dies on the sheet at all. So I ordered 20 of the 6x7 Magnet Dies from StampnStorage. They are wonderful. These are powerful magnets and get the job done. The backing of the magnet sheet is also a plus because they do not bend or curve and stay nice and straight in the box. I will be ordering more shortly. I used my Label Maker to list each Die on the back so I know where I got it from and the Part Number in case I want to order more. So I have everything I need and all is clean and orderly. Thank you StampnStorage. Love these cards and have bought them several times as my die stash keeps growing. They keep my dies easily accessible and hold everything secure. These are the best magnet cards! I love the larger 6x7 cards because they hold all sizes of my dies. The dies don't slide off or fall off, and they hold up after years of use. Love these magnet cards. I put all my dies on these cards. They are very sturdy. I taped the labels for the dies on the back of these magnet cards. Would recommend these to anyone looking to get their dies organized. Cannot do without these magnet cards. With the small pieces of die cuts, nothing is lost when using the magnet cards. Thank You. Loved the quality of this product! Better than I expected. Great product. Place them in my stamp sets with dies attached to the magnet sheet. Very convenient to keep stamps & dies together. Great time saver! Perfect way to store my Stampin Up thinlits! These are the best way that I've found to store all my Stampin Up Thinlits! Love them! I am so happy I purchased the Magnet cards. I had purchase cases for my framelits/thinlits and they kept on sliding around in the cases; the magnet cards hold them in place. They are great!!! These are the handiest thing for all the framelits. It is so nice to thumb threw them to find exactly what I need and also to keep everything in it's proper place during classes. Love these magnet cards. Excellent quality! I have both sizes and use both, but I really like the 6x7 size! Make sure you sign up for the Loyalty Program! So happy to have found these magnet cards! They are high quality & now I'm able to see all the die pieces clearly instead of in a jumbled pile in the envelope! Give them a try. You will love them! I don't know what I could say that hasn't already been said about the magnet cards! If you have any metal dies at all, these are a must for storage and easy access! A really great product...as are all Stamp 'n Storage products!! I love the magnet cards, I've ordered both the 5X7 and 6X7 multiple time and I'm always satisfied with the quality of the product. It is really easy to sort through all my dies and keeps everything organized. I store these in the Wafer Die Storage which are perfect for these magnet cards, except I have to many dies and now need to order another wafer die storage!!!! This the best invention for storing your dies. They stay put, easy to see, flip thru your stash easily. Love, love it. Bought 4 total. These are the best magnet sheet I've ever owned and am totally addicted to them! The 5X7 & 6X7 magnet cards are great, especially for nested framelets. The size is good, and the cards stack conveniently in my carry bin. Cards are also easy to categorize. I love love love these cards for my dies!!! They are the absolute best system to store my dies and hold tight!! Love the cards. Ordered another set. These cards are great for keeping thinlits and framelits organized and visible for quick access. I am very pleased with the quality of these magnet cards to store my dies on. I plan on ordering more in the future. I am so happy with my purchase of the magnetic cards. There will be no more fighting with and trying not to bend thinlits and framelits that are stuck to a piece of tape. The cards make storing the dies so much easier. The only improvement I might make would be to size the cards so they would fit into the plastic envelopes the dies come in. I wasn't sure how I was going to like these or how necessary they were but I LOVE them! 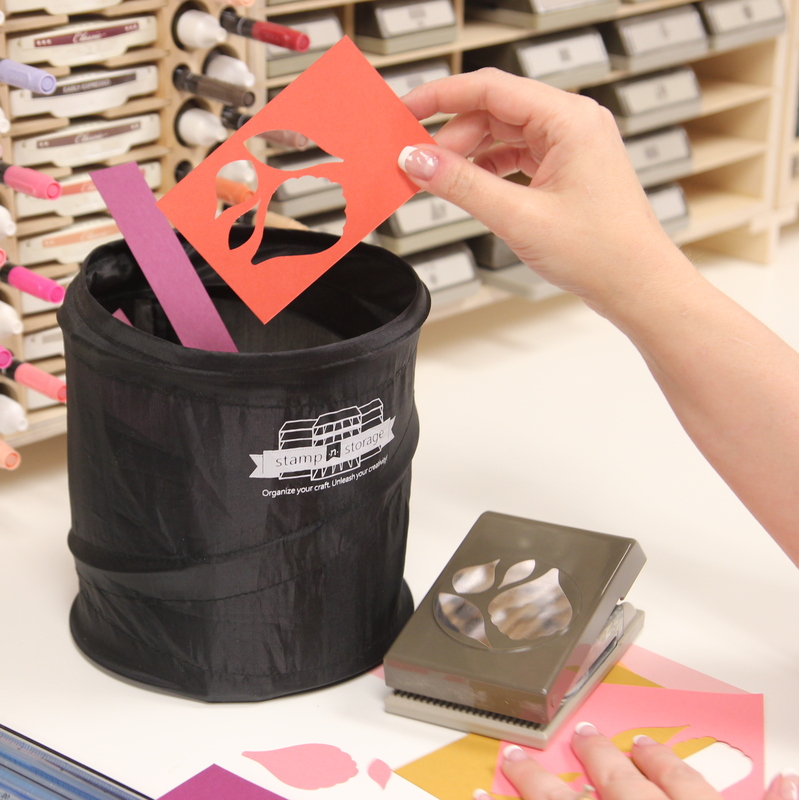 They are so great to keep die cuts organized. I put mine inside the coordinating stamp set box and they fit perfectly!! (I got the 5x7). I also wasn't sure that I needed 10 but I used them all and will be ordering more! These are just awesome and so well made. I have tried a lot of different brands and have attempted to make my own. Nothing compares to the sturdiness and quality of these. My framelits don't stand a chance of falling off with these. YAY!!!!! These magnet card die holder are perfect and keeps them organized. Love these, they have made such a big difference in storing my thinlets dies, and framelits. I've procrastinated but FINALLY ordered these magnet cards. I've tried others and have been disappointed but these are awesome -- highly recommend! I have bought other magnetic cards and they were disappointing. I was hesitant on these but after reading the reviews, I decided to purchase them. I am so glad I did. My dies store in a fourth of the space they use to. But what is even better, I use them more because I can see them and flip through them so quickly. Most of my dies are from Stampin'Up and I kept them in their envelopes prior to this purchase. This is a good purchase, you won't regret it. I use the magnet cards to store my framelits and I just love them. They are thin but powerful enough to hold the framelits in place. I have a huge amount of dies. I tried the vent cover route but they just weren't sturdy enough. This is definitely the way to go. Magnetic Cards Hold Dies Perfectly! I just love these magnetic cards. They are the perfect size for sets of dies that coordinate. This is my second set, and I love how easy it is to organize them all. I love these !! They fit my dies perfectly!! These are very sturdy. You can chose from different sizes. They are more than I expected and I will be buying more. So many magnetic die cards are flimsy and your dies slip off, not with these! You can also get the boxes to store your dies in, with or with out lid. Great item! I have tried several different ways to store my dies before discovering the stamp and store magnetic sheets. They are the best. The magnetics are very strong and you can place multiple dies on one card. I place labels on the back to identify that particular die set. I will use nothing else. These are the best thing to get your dies organized. They don't take a lot of room and everything looks neat and tidy. I love them!! this is the BEST product. makes all my framelits not only easy to store but easy to access. 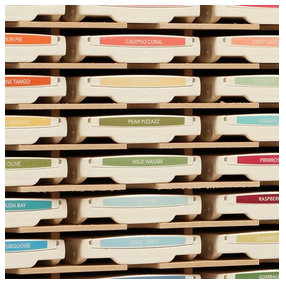 a brilliant solution to organizing all those dies from stampin' up! and i have almost all of them from day ONE!!! Magnet Cards - Always a Winner! I keep all my wafer dies on SNS Magnet Cards because I can count on the dies always staying put! Added bonus - each package includes labels and dividers. No need to shop for additional supplies! Win! Win! Ordered the magnet cards with case to catalog my dies. Started with 40. Wound up with two more orders for a total of 80. Now I need to order larger ones with case for my A G die sets. Love, love, love ❤️ this product. No longer losing small pieces. They rest securely on these magnets. This item is just the greatest, no more lost thinlits. If I had this earlier I wouldn't be looking for a lost star that must have fallen out of an envelope. These magnet cards are the best thing since sliced bread!!! They are strongly magnetized and hold dies perfectly. Thanks to who,ever came up with these wonderful items!! I have a BUNCH of these, and order them as I order new dies. They work beautifully in the holder S&S has designed, and they also fit into stamp cases. They are sturdier than I can build myself and I really love them. Hold your framelits securely but easy to retrieve to create! This is all I use now. LOVE it for organizing all my framelits!! I like the fact that the magnet cards are sturdy enough to hold my dies until I need them. I have ordered these more than once and will probably order more again as my die collection grows. I keep all my stamp sets with their matching dies in the extra cases sold by Stampin' Up. These 5x7 magnet cards fit perfectly and are stiff enough that the dies stay put on the magnet until I take them off. Tried many other ways, but these are simply the best. the stamps stick to the inside front cover. Label the spine and store in the StampnStorage Shelf units. These are the best holding magnet cards I have ever used. I have tried several other ways to store my dies. Nothing else compares. These magnetic cards make organizing my dies so easy. The quality is so good. Love them! Magnetic Cards - Highly recommend! I LOVE these magnets. The magnet is strong, so it holds your dies securely and with the magnet being attached to a thick cardboard on one side, when you pick the magnet up, it will not bend, thence keeping your dies from popping off. These magnet cards are the perfect solution for holding all my framelits in a nice wire basket. The magnet is strong enough so I don't have to worry about losing anything. These are a great way to store dies. Dies stay attached. After trying several storage solutions for thin dies, I finally discovered these magnet cards. They are the best I have found. These magnet cards are great for my thin metal dies. They are heavy duty and durable. I love that they come in different sizes. Magnet Cards - Best Ever! I have tried numerous products in order to store wafer dies on magnet material - duct covers, magnet sheets, etc. In all previous cases it was too flimsy to use on its own so cutting and attaching to a backing was necessary. Then the dies would often fall off! Enter SNS Magnet Cards! They arrive already cut to a uniform size and are attached to a sturdy backing. The Magnet is strong so the dies stay in place. The package even includes labels and dividers! LOVE THEM!!! These magnetic card are great the dies hold firmly they don't slide down ,The cards are sturdy .These are the best magnetic cards I have bought I will be ordering more.. I love how the dies adhere to the magnetic surface. I started with the 6x7 magnets as the dies in my Sizzix envelops were getting hard to keep in the envelop. Die sets are getting larger. I just bought the larger size first, and have started getting my big sets on these cards. Works great, nothing falls off, there is plenty of room for even my biggest die sets. Love these. Magnets are strong and hold everything in place. These magnet cards are the most awesome organizing addition to my craft station. All my framelit, thinlit and edgelit dies are now compactly and perfectly organized. I label the dividers that come with the pack by category name. The 6x7 size is great for holding more dies, and allows room at top for label with exact name of die set. I couldn't be happier with these most sturdy and high quality magnet cards!! love this product. I keep coming back for more of them. They are the best for holding my dies in place. These cards are high quality and the perfect size. I LOVE the fact I get two different sizes in the same package! These are perfect for all Thinlits and Framelits! They are so Awesome wish I would of got them sooner. The 5x7 Magnet Cards are PERFECT for the dies I purchase from Stampin' Up! - the cards also fit in the blank photopolymer stamp boxes! I label these on the side and store them like I do my stamps. No longer stored in the plastic sleeve - much easier to find now! I love the Magnet Cards, it make using my thinlits so much easier. I can flip through them and I can keep them organized. So, glad I found these. I love these magnets. For once, I feel like I am finally getting organized. I wish I would have ordered more when you had the encourageing free shipping, otherwise I would not have ordered them. So I guess I will wait for the next promotion. But I do love these magnet cards. They are the bomb! I love these cards. They are not available here. The magnet cards are the best thing ever. I plan to purchase more. Love this product. Makes everything so easy to organize and store. This is the best organization tool for wafer dies. Love this product . I have tried other magnetic sheets but my dies always fell off. Not only do I recommend this product , I have bought more . I have quite a collection of Thinlit dies and storage was getting crazy! I tried regular magnets, they were not strong enough. I love these cards. Strong enough to hold things in place and keep organized.!! I love the sturdiness of the cards. Very excited that they fit in my stamp case with the matching stamps! Perfect size! The best way to keep thinlits organized. Love these magnet cards. Great way to store and organize my dies. Dies are always easily excessible and safe from any bending or damage. I would recommend these to anyone looking for storage of their dies. Works perfect! The best way to store and display your metal dies. Wonderful product, heavy duty. Never have to worry that small pieces will fall off and get lost. These are the most wonderful magnet cards for dies there are! I've tried a couple others but these are perfect. I have bought so many of these cards over the past few years and always great value and quality! Best way ever to store your metal dies! Since I started using these card it has made things so much easier, always staying in place, thank you! There is nothing like having the right product to store your craft supplies. Magnet cards are just that thing. I would want no other product than this to protect my inventory of dies. I am so satisfied. I will be purchasing more of them in the near future. I am so happy to get my framelits out of their plastic sleeves. Having them on the magnet cards is so convenient. Just what we needed. Great for keeping our framlits with our stamps! Just the right size too! No more cutting! I love these cards! I ordered both sizes and am very pleased with each. I will definitely be ordering more. I love these magnet cards. The only thing I would change is to make them a little more sturdy. When I was handling one it bent slightly and caused some of my dies to pop off. Otherwise, I absolutely love them and will order more in the near future! I would give this a 5 but they were a little too long for MY need. Still love 'em though. If you have ever experienced losing one tiny piece of a die set, this item is a life saver. The pieces adhere well to these magnet cards, so you do not have to worry about searching for them, especially sets that come with numerous small pieces. Sometimes just the loss of one tiny piece ruins your whole set! Also like the sticky labels that come with the cards to help organize my dies. Great product! These are the best things for your thinlits and framelits. They hold tight so they don't fall off. They are sturdy. Don't know what I would do without them! These magnet cards are so sturdy and have a strong magnetic pull on the dies... no shifting! I've bought several sets of these cards and they are by far the best way to store my dies. I keep them standing up in a photo box. If I can't see products, I forget I have them. These cards are so sturdy and the dies really stick well. I love these magnet cards! They are sturdy and hold even the smallest die pieces. I purchased one set of the Magnet Cards, not knowing how well they would work. Well, it took me about 5 minutes to fill the 10 cards, and will be re-ordering. They are top quality, perfect size and reasonably priced. I would, and in fact have already, recommended them to many of my crafting buddies. Thanks for carrying such a terrific product. Talk about getting organized, knowing where everything is. These are a MUST. These are great magnet cards because they are sturdy (unlike the magnet covers at Home Depot) and fit nicely in the SU die plastic cases. They are cut on the shy side, so they slip in perfectly. I will be buying more. I love these magnetic cards. They store my thinlits and other dies perfectly. Love my magnet cards. Best product ever. Love this product! This is the third bundle I've purchased. I love these magnetic cards. They are sturdy and backed with a thick cardboard to keep them from sticking to each other. I have a lot of dies and they can now be stored in one box - compact and easily accessible. I love these magnetic holders. They are strong enough to hold your dies so they don't slip off yet easy to remove from the board without of tugging and pulling to get it off. They are perfect. I like the quick shipping on items from Stamp N Storage. It's not quite wide enough for the larger die cuts. I love using these to keep organized when i have the stamp set that matches the dies and I just put the dies in the case with the stamp. I absolutely love these magnetic sheets. My dies are now organized and take up a lot less space. I could believe how quickly they get these to you. Thanks for a terrific product and great customer service. I too have used other magnet items for my thinlets and framelets, however, these are the BEST Ever!! They fit nicely in my Stampin' Up! stamp cases right along with my coordinating stamp sets!!! No more wasting time trying to find the correct thinlets or framelets. Perfect. Best and strongest magnets. Ever!! I LOVE these magnetic sheets. My dies keep popping off the magnetic sheets that I have my dies on now . When I put the dies on these sheets they stay right where you put them. This product is great for storing dies. I also love that when I working with a particular die set, it helps me stay organized and eliminates misplacing a die. These are wonderful they fix perfect in my Stampin up cases, so I can keep my dies and stamps together. Love these magnet cards! And the speed in which I received them was awesome! Thanks Stamp n Storage! Great product! They hold my thinlits and framelits in place. I keep one by my Big Shot so I don't lose my framelits or thinlits. They fit nicely in the Stampin' Up! cases. I love these magnet cards. They are perfect to organize your dies. I bought 4packs for myself and organized all my dies. Then I bought some for my aunt and sister. I would highly recommended these to anyone who has dies. I absolutely love this product! It fits perfectly inside my Stamping Up cases and is sturdy on its own also!!!! Great price for my money too! Love the magnet cards! Took me longer to find my dies to put them onto the magnet cards. Now I have my thin dies all in one place. Love these., Will have to order more. I got them really fast too! This will help keep all the little dies together, no more losing the small ones in the set. I am amazed at how much more space I have now that my dies are on these magnetic cards. The project to convert several dozen dies was completed in no time at all. Now I can easily find any die I want. Love Love these Magnet Cards. So easy to find the right set and get it back in one spot!! I just love these magnet cards. These cards are so much stronger than the vent cover sheets. I photocopy the Thinlits sheet from SU, trim it to fit the magnet card and glut dot it in place. This way you know if you are missing a Thinlits and they don't slide off the card. This is a wonderful product. I used them to arrange and organize my thin, steel dies and for the first time I'm finding the die I need quickly and easily. And...no more hopelessly tangled dies! These magnetic cards and worth every penny. I first noticed the magnet cards on utube. They are fantastic. I now have a great way to file and store my thinlets and framelits. This is the second time I'm ordering these magnet cards for my Die cuts. I really love them because they keep everything together. I also bought the larger size this time and now it completes my room! I plan to buy more in the future. Thank you for making such a great product! I needed these for my dies and they work wonderfully! I have tried 3 previous ways of organizing my wafer dies in the past before these....THIS IS IT!!!! Received my first packages of magnet cards last fall when they had the Black Friday special, had stuffed them in a drawer and sorta forgot about them honestly. Frustrated over the last attempt to organize ny dies triggered a light bulb to go forward and try the Stamp N Storage magnet cards ( ie: putting my toes in the water to test). Liked them so much I ordered several more packages to get up to my ankles with this storage system. After receiving that batch I jumped the entire way in and ordered the large wafer die totes and more of the magnet cards a couple weeks ago. Just place another order for a couple more packs of cards since I used up every one I had purchased. They are so sturdy, with strong magnetic ability and the chipboard backing is VERY sturdy, not flimsy at all. Give it a whirl with a pack or two to start with if you haven't tried them yet. Love the Magnetic Card s, they are exactly what I needed for my cutting dies. This is my 4th set of 10's , 6x7 .Perfect size, they stick beautiful, and are easy to get them when you need them, plus you have them organized. Customer service great, very helpful. I definite recommend this product you won't regret it. Fast delivery. Outstanding customer service. I place all of my dies on these magnetic cards,so I'm able to keep them organized. Great for storing those thinlets! I love the Magnet Cards. They keep every thing neatly together. Wish I had this item before I lost a star for my Christmas tree framelit. Thanks to this product I won't lose anything else. Love this storage solution for metal cutting dies. Keeps everything in order. I have purchased Magnet Cards in the past and was so pleased with them, as I have added more dies to my growing stash I needed more. Magnet Cards make using my dies much easier then pulling them out of envelopes where they are either loose or taped to cardboard. Easy to see and right at my fingertips. Magnetic cards are fantastic! They hold my Framelits & Thinlets, like my husband holds me - tight! They are now easily accessible from their storage box. I absolutely love these. It is so nice to have all my dies neatly organized. The only negative is that the 6x7s are actually 6 x63/4. I am very pleased with them over all and the great customer service. I have finally found a great way to store my Thinlits, Framelits, Edgelits and all my dies for my card making. It is a very nice way to keep them together and not have to bend them to get them off a piece of paper with tape on it. These magnet cards are exactly as described and much more! My dies were constantly falling out of plastic baggies or slipping out of their awkward, hard-to-handle SHARP plastic shells. Now all my dies are neat and instantly visible. I will be buying more as I add to my die collection! The magnetic sheets have the perfect "strength" for holding the dies. They fit so nice and neat in the storage box as well. Love this item! I love these cards for storage of my dies. Keeps them in place and safe from bending. Makes it easy and saves time finding the right die when you want it. Planning to order the larger size. My friend had these and I was impressed. They really keep the sets together and prevent the dies and Framelits from bending. Very good product. I recently purchased Stamp-n-Storage products. The shipping was super fast, and everything has been very well made. LOVE THEM! They are beautiful and have simplified my stamping process, making stamping even more fun. I couldn't stand the sticky tape used with Stampin' Up's framelits. I used these magnetic cards to store framelits inside of the matching Stampin' Up stamp case - works great! I smile every time I look at my reorganized stamping space! I store all my stamps and matching dies in Stamping Up empty cases and the 5x7 fit inside beautifully, they get labeled and then onto my Stamp N Storage shelves. I have purchased other magnet pieces from many and these have the strongest magnetic pull and the dies do not pop off because of the firm backing on each piece. You will be very happy. I am ordering more today! Needed to get my dies organized. I love the magnetic cards to store my dies. The 5x7 card fit my dies perfectly. It's great to have them all organized and labeled. I love these magnetic cards. However, they are about a half inch to tall for the Stampin' Up framelit/thinlit envelopes so I end up trimming them. The magnet cards make storing my thinlits a breeze...so much easier than trying to peel them off that extremely strong tape, I was always worried that I'd bend them. Not now! Love these strong and sturdy magnet sheets! Holds my Framelits & thinlets perfectly! This makes 8 sets of the magnetic die holders that I've purchased. Strong grip, yet releases die easily, I either adhere die pkg label to back or write (with Sharpie) the name & number of dies. They fit into the large, lidded box so well! The magnet cards are a great way to store my Stampin' Up! thinlets and framelits! This is my second order. Whenever a new crop of thin metal dies are adopted into my home they immediately get their own room on a magnet card! They are safe and sound with no fear of small pieces wandering away and getting lost. 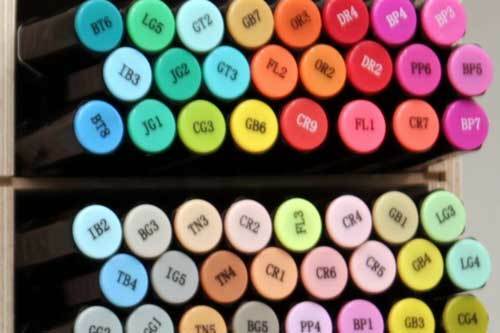 There are even labels to help this OCD woman keep them in order! Great product. Perfect size and sturdiness to hold thin metal dies. I store mine along with the coordinating stamp set and everything is all together when I'm ready. I really like the magnet cards for my Thinlits dies. They hold my dies in place beautifully. Magnets stick together, but these have a sturdy backing that holds them upright and allows for easy searching for the one die you are looking for. Best way to store my Stampin Up Framelits! This was my second order of the Magnet Cards, they work perfectly for storing all my Stampin Up Framelits! Love these magnet cards. Perfect for thinlits! I tried a store bought magnetic card system, the cards curled and the thinlits fell off. This system holds on tight. You can turn the cards upside down and the thinlits do not fall off! Love it! I recently purchased the magnet cards for my die cuts. They are great! I have purchased other magnet cards that do not hold the dies flat like these do. The storage box keeps all my dies handy and readily available. If you could take off about 1/2" off the sides, they were fit perfectly in the Stamp'n UP folders. I like to keep my products in their original packaging as much as possible. Love this idea to store dies, very sturdy and worth the money. Thank you. Storing dies on these magnetic cards makes them quickly visible, stay put, and store in your own sort of order. Don't take up much room in the corresponding box. I love the magnet cards for cutting dies. the 5/7 cards fit into the stampin up stampset cases and keeps the dies and stamps together for easy retrieval. I write the name of the set and how many dies ( and month/yearof purchase) on the back, so I never loose the small ones. This is a great way to store your framelits etc. I love having them all together and not falling all over the place! Outstanding Product - Great Price! I have made several orders for these magnet cards to store all my Stampin' Up! dies. I had tried other magnetic storage solutions but none have worked as well as Stamp-N-Storage magnet cards. The strong magnet and solid backing make these a joy to use. I have had excellent service on each order. Stamp-N-Storage is a great company! These magnet cards are the best way I have found to store wafer dies. Easy to organize, easy to use and much stronger than the magnetic heater vent covers I was previously using. Thank you Stamp-n-Storage for another great product. I ordered more of these for the new products that I recnetly purchased. Love how they keep my Thinlits and Framelits organized and within reach for ease of use. Can't say enough about Stamp-N-Storage's products!! These cards make it so easy to organize the thinlets dies. Love them!! At last, a viable solution to thinlets and edgelets storage. The small size fits perfectly in the Stampin Up Cases. The small storage box holds plenty of the larger size!!! These Magnetic Cards are wonderful! I love being organized and knowing all of my dies are in order and not lost somewhere! Thank you for such a well-made product. MagneticCards are awesome!!! Love my magnetic cards. So easy to find the die I'm searching for. So glad I don't have to worry about losing one of the dies. I absolutely love these magnets. So easy to store and get to my dies! LOVE these! Quality is GREAT! Have bought many, will buy more! And you can cut them if you have to. I had a problem with the shipment of my order, with an incorrect item getting shipped. When I notified Stamp n Storage about the issue, they went over and beyond anything I would have expected. I had the corrected item in a couple of days! Ironically, a similar problem with a different company the prior week was handled in the opposite manner, so I wasn't expecting miracles. Both sizes are great! Love them! Love, love these magnet cards! I use these for my Stampin Up thinlits and framelits. They come stuck to a paper card with tape. The magnet cards work so much easier. They hold well but easy release also. Love these! The best way to store my dies! The magnet cards are a great way to keep my dies and stamp sets organized! The magnetic sheet is strong and sturdy. Framelits, etc., stay on firmly and store easily with these cards! Love these magnet sheets! I don't have to worry about them bending and my dies falling off while I am flipping through them. Great product! This is my second purchase of these cards. I loved the ones I received but was dismayed at how pricey they were. So when I needed more, I attempted to make my own...buying magnetic sheets and adhering it to cardboard. What a waste of time and money that was. Although the dies do stick to the ones I made, the magnetic cling is very weak and they tend to slide all over the cards. Your magnetic cards are super strong. So despite the pricey nature of nearly $2.50 a card, I convinced my friends to stick with you...the DIY version fails in comparison. I love these magnetic cards. It has help me truly sort all my different dies into categories for easy reference. I have ordered about 6 of them. I love these new magnet cards! They are just the right size to organize my dies. I'm always impressed with how much thought is put into each product made by Stamp 'n Storage. Thank you for helping me stay organized! The 5x7 magnet cards are the perfect size for my Stampin Up dies & framelits. They fit in our stamp set cases or the can be stored in small two ring binders which allow easy access and I can catalog them easily. Perfect for my use. Great way to store dies! I love these cards! I did a lot of research trying to find the best deal on magnetic cards. While these are more expensive than some of the choices out there, these are very heavy and can stand upright in a container without bowing over. The wafer die storage container from here is on my wish list. I did make the mistake of ordering two packages of the 5 x 7's. Not all of my dies fit on that size card. I will definitely order the larger size. (Maybe they will be on sale again soon?) But I am sure I will fill my leftover 5 x 7s soon anyway. They are well worth the extra money. You won't be disappointed. I think, I have finally found a foolproof way to store my dies. This is my second order and I could not be happier. Dies are organized and ready to use:) Thank you for creating them! I have started using the magnetic sheets to organize my dies. I have both sizes but am leaning towards the larger ones. I also bought the large wooden tray for storing them. Love both products ! These Magnet Cards are the perfect solution to storing and organizing my dies, and as a bonus, they come with labels! Excellent product - just what I needed to keep organized for my paper crafting! I love t h e magnets for storing thinlets. they take up no space. will buy more. wish I had bout the 6x7 size. These are the best magnet cards available, so strong and sturdy. Nothing falls off and they are sturdy enough to stand alone in a magnet card holder. I've tried other brands, that are flimsy and dies come loose. Not these, they're amazing! I love how sturdy these magnet cards are and of course, how well they work in my Stamp-n-Storage Die Storage boxes. These are great magnetic cards. My framelits and thinlets cling to these like no other that I have tried. Love the thickness of them and even when dropped they stay put. I just received my second set of magnet cards. I filled up the first set and never want to be without them. I can't even think of any way to improve them. They are already perfect. Awesome product. They're easy to cut to keep in the plastic sleeves my dies come in and they hold the dies and framlets really well. These Magnet Cards are something I just could not live without. Especially with the very small pieces in the most recent die sets, the Magnet Cards are invaluable. I have bought and re-bought both sizes of these cards. These magnet cards are the best!!!!!!!!!! I couldn't find any anywhere else that even come close to these! Can't do without the magnet cards!!! These have been a life saver for me. Now my dies are organized and handy. Love them!!! I have tried several methods of storing my dies and this is the best. Wish I would have found it a lot earlier. My dies are organized and don't slip off. This magnet is strong. Love it. The magnet cards are the perfect way to keep my ever growing collection of Thinlits and Framelits organized and within reach. This was my fifth order of the Magnet Cards to store all my thin wafer dies. I've tried other magnet sheets and they were just not as strong. No losing dies now! I mostly purchase the 5 x 7 size because they fit my preferred storage space. They are front and center when I need them. And the bonus! Stamp-N-Storage sends labels and slightly larger cards to use as dividers! Now that is true customer service!! Love the magnetic boards, they keep everything in place and putting a lable at the top shows what die or famelit it is. Also it's a room saver. I love these magnet sheets for my large dies. It is just wonderful. I wish I had discovered these cards sooner! 80 cards in use take up 5 1/4 inches of space. The magnet sheets are of such strength that dies stay in place. With the exception of the new layering dies (circles, oval, & squares) and the Sweet % Sassy frame;its from Stampin' Up! each one of my die sets fits onto one magnetic card. I have three edgelit sets stored on one card with room for more. Storing and keeping track of my dies while in use has never been so easy. A little flimsy for the cost, I have purchased similar item from other vendors and find them to be a tad bit better and not near as pricey. No losing small parts anymore. I needed more of these magnet cards since I have added to my growing collections of small dies with small parts. Never will lose one again. Great storage idea! I love these magnet cards! They keep all my dies in perfect shape and attached to the magnet! I will use these forever! No better way to store your dies! I have not had my framelets and thinlets easily accessible and categorized since I first started purchasing them. They are organized now and are in use all of the time without any fuss or headaches in locating them. Love these magnet cards. They are strong and hold the thin dies so well. Sure makes organizing the dies easy. There are so many ways people store their thinlits, dies, etc. that after looking at Pinterest for a couple of days, I was totally overwhelmed. I picked up my Stamp-n-Storage catalog and when I saw the magnet cards I thought I hit gold! Holy cow, how easy can this get. I choose to store mine in the Stampin' Up Stamp Boxes so they are easy to transport when I want one or two with me. The Magnet Cards are of excellent quality and my thinlits do not pop off sporadically as with "other cards". I have purchased 2 sets and I will be purchasing more. And I will be purchasing more of Stamp-n-Storage products because their quality is superb and I like "let's keep it simple"! I am happy with the magnet cards purchased and so excited to have them! They are already keeping me more organized, making my thinlits, framelits and dies more easily accessible and in plain site for me to use. They work just great for my thinlits and I like how organized they stay. I wrote a whole blog post with tons of pictures if anyone wants to see more pictures: I took front and back of the cards to show that they are more than just "vent cover magnets". http://3monkeysthrowingaroundsomepaper.blogspot.com/2016/05/organizing-ideas-stamp-n-storage-die.html GREAT purchase, worth your money!!! Was glad to have heard about these---makes storage so much easier. I love the Magnet Cards I just received. They are sturdy and I love the way my framelits fit on these cards. I will be ordering more soon! These are so fabulous I keep reordering more! I use my dies a lot more now that they are organized. Love these cards for the framelits!! Easy to use & see! Love them! I love these Magnetic Cards. They work great with my die cuts. I love the magnet cards for die storage. It's so easy to flip through and find what you want and it keeps all the dies safe and secure against the card base. these are very strong magnet sheet . I wish I would have ordered more . I ordered 80 sheets but we as crafters like to have more. I had purchased clear envelopes, a little bigger than the cards. I sat yesterday, and started to put the dies on the cards, then slip in the envelopes. Just love it, so neat, they do not fall off the cards. I am in heaven, thanks for the perfect product. All I can say about these is that for the first time since I have been using dies, I know exactly what I have. I think they are marvelous. Love this for storing my dies. Wish there was a larger size for the bing ones too. I have struggled with organizing my dies. It was so difficult to separate them from the adhesive that came with the packaging. So happy to have found just the answer with the magnet cards. I can quickly locate the dies, apply the embossing, and return the die to the card. I started out with the smaller size and recently got a pack of the larger size for my bigger Stampin' Up! framelits and thinlits. Love your products!! The magnetic cards (5x7) are a perfect size for the dies I have stored away in a notebook. They are durable and very strong. Wish I had purchased more so that I could finish my organizing. That will be the next project. I have been eyeing this product for several months. I finally broke down and purchase 20 5"x7" cards. I am beyond impressed. The product is the best that I have ever come across. I should have ordered more. Next time I will order the same size and the larger size to fit my larger dies. Love this product. The magnet cards are the perfect solution for storing the Spellbinders that I own. They are sturdy without taking up a lot of foot space. My only regret is not ordering enough. I love the magnet boards - they hold the framelits very well & now I am all organized - I have one large box full - thank you! I had a box full of framelits in all different sizes and shapes containers. It was hard to find what I wanted. Now they are all neatly on a labeled card and I can thumb through them in seconds to find them. I LOVE THIS PRODUCT!! I needed something to keep my Sizzix Dies together and when I saw your the magnet plates I had to get it. It's wonderful and I love them! This was my second order for the Magnetic boards. They have made the organization of dies so simple. No more shuffling through drawers to find what I need. Thank yous to the design team. These are absolutely the best. I can see my frailest instantly in one glance. These provide the answer about how to store and easily access dies. The larger size work best for my collection. I can now more readily access the dies so will use them more often. No more digging through envelope cases, removing and replacing the die(s) and closing the case. I don't know why I didn't get these a long time ago. They fit perfectly in the plastic sleeves shown in Jennifer McGuire's storage system. And the backing provides the support that other magnet sheets don't have. These magnet cards are a perfect fit for all of my nested & thin dies. I love having them all organized and not having to dig thru a box to create using them. The stickers for organization help when someone asks "what brand is this die?". Bought 20 but think I'll need to place another order soon. Well, I should think about taking out stock in this company. This is the fourth review I am filling out today. I LOVE their products .... and one day have as need and orderly a crafting area as they do. You will never be disappointed with their products! I ordered 40 magnet cards for my dies. I love them so much I ordered an additional 80 cards. The only problem I have is when you take the die off the cards it is very hard on your nails especially for very thin dies. My dies are so well organized with the magnet cards. They take less space to store and so fast to find the die you are looking for. I would recommend this product to all crafters' who uses dies. I would rate them 5. Very happy with my storage for dies. Want to know what thinlits you have? The magnet cards are great. Putting the thinlits on the cards are easy to get to and you flip through the cards to find the one you need you need you know what thinlits you have. Keeps you from buying duplicates. I've tried many different ways to store my dies and this is by far the easiest. What a great ideas for storage. Love the magnet cards. Purchase 40 of them but need more. I will we purchasing another 20 or 30 soon. Also will purchase the box with lid to store them. Love this product a lot because it takes so mush less place to store them and easy to find the dies with the separations included with the magnet cards. great for storing all my framelits. Gives me more space for other things like embossing folders! What a perfect way to store framelit and thinlits dies!! Love this product so much, I ordered 2 more sets. Easy storage and I labeled the pages for easy find. This is a great product. I don't think anything is needed to improve it. I am thrilled that it will add to the ease of use for my dies. It is the perfect storage method. This is my second set of the magnet boards and I love how powerful they are and how well they hold the dies. I order the biggest size so all my large dies will fit on each one. A great product! Magnet cards are the best - and free shipping! I had been using magnet sheets from Avery adhered to cardboard cut from boxes - did't work very well. The magnet cards are SO MUCH BETTER! I've ordered three - 3! - times so I can use them for all my dies and flip-it card dies. Love the concept and it is steamlining my storage but I do wish they were a true 5/7 in size. I love these magnet cards. I use them in the die boxes, but they also work in my holiday boxes. I keep all of a particular holiday's paper, ribbon and dies in a box. This helps keep the holiday's dies nice and tidy so I can find them easily. Next will be a storage box to hold all those dies. I already own 5! I find these cards so helpful in organizing and storage of my dies. And the save space. The are great! I love the magnet cards. Recent purchases from both Stampin' Up! and Gina K Designs have come with stamps and dies. In my craft room I have stored these in SU!boxes and the magnet cards (5X7)fit in the same box with the stamp sets! WooHoo! no searching!!!! I love these magnetic cards. All my dies are organized. My craft space has a large chalkboard. So all my magnetic cards with a magnet on the back are hanging neatly and easy for me to display and find. I find it far easier to locate a particular dies set with the use of this product. the magnet keeps everything in place and very neat and tidy. After trying some magnetic sheets that fit into a plastic carrying case, I was disappointed. The magnetic sheets would bend so easily, dropping the wafer dies. What a mess! Someone suggested I try these magnetic cards, so I did. Soooo much better! I am very pleased with these. I will be ordering more. These are the best solution for dies! I've stored my framelits/dies in all sorts of storage ways. This by far is the best solution. It saves SOOO much space and they are easier to grab and use. Love these! One suggestion: Maybe have them with tabs on the top. Like three different tabs so you can flip thru them a bit easier. Like one tab on the right for one board, one with the tab in the middle and another with a tab on the left. I love them anyways...just thought it may keep them from getting messed up by trying to get my fingers between each one when looking for a certain one... and may make it easier to see when I label each one individually. Only a suggestion. I do like the dividers to help sort them though. These are amazing and do the job perfectly. Wish I had ordered two sets, but I'll just have to get the next set another month! I love the way they "hold it all together" and make it easy to use and store. These magnetic cards makes viewing, storing and caring easy for your framelits. These holders are great and a great way to stay organized. I am so happy with the ease of use now that the framelits and thinlits are on these cards rather than in the packages. So much easier and so organized! Only problem is that I didn't order enough!! Thanks for another great product! This magnetic cards are so versatile and easy to take along. They can easily hold several dies and they seem very sturdy. I love this products for all my die cuts. They hold and line up perfectly for easy viewing. Second time I've purchased this product. I love these magnetic cards. It help me organize all my thinlit die cuts and they are easy to remove from the card. I also bought the wood storage for these. I had to buy more cards because I loved the way they store by craft tools. I love the magnetic holders. They are by far the best out there. They work great and store perfectly. My dies never fall off. This is the perfect storage solution for the framelits. Instead of multiple envelopes, these stack easily and the magnet is strong enough to hold the die, but not too strong that it's a pain in the neck to remove the die. This is my second order of Magnet cards. Now I have enough for all my dies. I was very pleased with the strength of magnetic aspect. It's strong enough to hold the dies, but it's easy to remove the dies from the backing when needing them for a project. These are amazing. So easy to use and they cut down on storage space as well. So glad I found them. Will purchase more as needed. After flooding in May15..had to regroup the hobby storage thing. These are more sturdy and better sized then things I had used. These magnet cards have helped me so much to get myself organized and keep my thinlits safe and easy to store. So glad I found them. Absolutely love these magnetic holders, they have a strong hold. Ordered 2 sets to-date and will order more if and when needed. Love these! STURDY AND EASY TO ORGANIZE YOUR FRAMELITS AND THIN DIES. I have been trying to make sense of all my dies. I discovered your magnet cards and am finally getting all my dies onto the cards and filing them by category. I'm addicted! I love the magnets. Now I have all my dies together. My only complaint is packing for shipping not very good. My last order the box was all busted . The postal service had to srink wrap it. Empty space in box with no bubble wrap or other packing material. The bags that hold the magnet cards was all busted open. It was a mess. I have several fabric mini cubes and the magnet cards fit perfectly inside them. I am able to separate and post where each of my dies are and by whom. I love them. What a great way to store dies. I advertise these in my Stamping Up classes. I really like these cards. The magnets are very strong and the dies do not fall off the magnet. Love these! Magnet is strong enough to hold the dies but removing the dies is easily accomplished. The cardboard backing allows these to be stored upright in a basket or container. Highly recommend! These magnet cards are awesome!! I was sooo happy to get these in the mail!! I am a SU demonstrator, just starting out, and starting to accumulate a lot of dies. I think SU SHOULD INCLUDE A MAGNET CARD IN EACH DIE SET THEY SELL!! I even wrote and told them so. I'll be ordering another pack very soon!! Love how big and strong they are! This system is terrific...so easy to access my framelits! The storage boxes complete the system! You won't be sorry! The best organizer for your dies. I just really like these magnet sheets for my dies. they hold the smaller pieces very well and keeps them from getting lost. These are the greatest! I am so glad I bought these for my framelits/thinlits storage. The strength of the magnet is perfect, I don't ever have to worry that a thinlit/framelit will fall off. These cards are the best storage solution. I had my dies stored in CD cases with magnet pages. They worked but not the best. These cards have reduced my need for multiple tubs! Love them. I recently ordered my third set of magnetic cards. They are light weight, yet hold the SU framelits and thinlits perfectly. I make a copy of the framelits before I take them off the sheets from SU. I glue dot the sheet to the magnetic card. Then I place the dies on the sheet on the magnetic card.. Then if I use one, I know right where it goes. It is a great organizer and helps to keep track of the framelits on the magnetic cards. This is an awesome product and is great for organizing dies; it also is an efficient space saver! Not only are these magnet cards get for storing the framelits, thinlits, and edgelits I use for making cards, but they're great for small groups in kindergarten when we're using magnetic letters and numbers. I would also use them with students in reading recovery. I only use this product since being introduced to it at a show where they were a vendor. The come in two different sizes and are fantastic. I can get most any size die on them. I would highly recommend this product. Best magnetic boards out there. Framelits/thinlits just stay attached even if you drop the case. I have many, many thin dies. Storage was a real problem. After finding these wonderful Magnet Cards, my problem was solved. My dies are more easily accessed, and I find myself using them so much more. I have even placed the Magnet Cards and dies in the cases with the coordinating stamps sets. The magnet cards were perfect, and exactly what I needed. There was an issue with my shipment, and it was quickly resolved. Highly recommend and will be back with my storage needs! The perfect way to store your dies. So happy to have found this site with all their wonderful products. Will be ordering more. I love these magnet cards they work great for my thinlets. They stay put and it's easy to get to them, no taking them from packages and putting back in packages! It's a must have for your thinlits dies, but a bit to expensive for the amount you get. These are sturdy and hold the dies without them slipping!!! Theses are great!! These cards are AWESOME! Wish I had known about these a long time ago. I just found about about stampnstorage so I'll be purchasing more great things. I will be ordering the box to hold these very soon. I will at last be able to scan my dies in a very easy manner. These magnet cards are the best. Sure saves losing those small thinlet dies. Thanks for a great product. I've had this product before. I cannot find it anywhere else in this size. I use it for my thinlets. I have tried three other systems and none compared to this one. My dies are in one place and take up little room. The magnet cards are strong and easily hold the pieces in place. I love it, love it, love it. I love the easy storage of the magnetic cards. It simplifies storage and so easy to look through to find just that right die cut. Love, love, love this product. Best way to store dies! I love these! No more losing any small dies from falling out of a package! They are great! I love these. They are high quality and have a firm back lining that makes them very sturdy. I won't buy any other brand. The Magnet Cards are really the way to go. I have wanted them for a long time after watching many great SU demos using these in their craft rooms and was so jealous. ;-) So I finally put in an order for a small amount just to see if I would like them. Wow!! Why oh Why did I wait so long. I really work best when I can see and put my hands on my craft items in a hurry. These magnet cards are just the best. Very sturdy and so easy to flip through and see just what I am looking for. Just love these. These are awesome. Nice and sturdy, strong magnet, perfect size. I love them. Just wish that they had some instructions as to the best way to use the labels. Put them on the back cardboard or on the magnetic part? Although I keep my dies in a box, these magnet cards are wonderful. So easy to sort them by brand, subject, etc. I used dividers between the categories to make it easy to find just what I need. Awesome idea! So glad I orderedid them...but I ordered too many and now I need to order more dies...what a pity! I've tried so very many ways to organize the dies I have for crafting. Each improves on the last but it still left it less than satisfactory. My husband said less dies might work but I quickly chucked that idea. I've been using these magnet cards for quite some time now and haven't needed to change anything. I put the dies on the magnet side (duh) and tape the pkg/mfg info on the other side. That way if someone want to know what a particular die is, I can flip the magnet card and tell them. WONDERFUL product!! Cards are wonderful, but better is your faith which I share, God Bless You! This is a super way to store all nestabilities. The magnet is strong. The pieces do not fall off in handling or in upright storage. The nestabilities come off with a little bend and fingernail coaxing. Love the Magnet Cards! My magnet cards arrived quickly and I put them to use right away. I was delighted to finally have my thinlits organized neatly. No more trying to squeeze them onto a small magnet card. Love this product! These are not your everyday run-of-the-mill magnetic cards; these are stronger and much sturdier than any others I've seen. In fact, i bought some from my craft store & they had to be thrown out because they warped to the shape of the container I purchased for them. These magnet cards are made to last, so I ordered more right away! I'm really happy with the magnet cards. They are working out even better than I thought for my storage needs. The only problem is that I need to order more! I've been looking for something that could organize my framelits and make them more visible! These are perfect!! These magnet cards are awesome! They are sturdy and the dies stick to them very well. These are awesome. Nice and sturdy and a strong magnet. I wish they came in larger quantities for a better price. I had bought magnetic sheets at Walmart which I cut to fit my dies, unfortunately, I had to also glue the sheets to cardboard for them to be strong enough to hold some of the dies. With the Magnet Cards all the work is done for me and I can easily put my dies on the sheets and file them. Thanks Stamp-n-Storage for your great ideas! I love my magnet cards, they allow me to store my dies with the matching stamp set. These are the perfect items for my die cuts. They fit nicely and there is a label you can use enclosed in the package so I can actually find what I need without looking through the entire box. Don't know why it took me so long to order the magnetic cards. They take up a fraction of the space to store and the dies are so easy to select now. I immediately ordered more. Love them!!! Love, Love , love them . Before I was using the vent covers but there is NO comparison to these, they are so sturdy and strong, the framelits are easy to get off and the magnet is very strong. These sheets are wonderful. I was able to cut them a bit to fit my Stampin Up folders. I was surprised by the fact that they are backed by cardboard but this gives them strength and the dies don't pop off like others I've tried. Using these Magnet Cards I have mounted all of my SU! framelits and thinlits on them and have kept them in their separate packages. Works like a charm! I also made a copy of the framelits/thinlits before I took them off the white cardboard and put the copies on top of the Magnet Cards to know how to place them after I've used them. The white cardboard is history! I have tried different magnets but these are the best. They are sturdy, strong magnet and easy to cut if needed. I am on my second order. I have lots of dies and these magnet cards are the best way to store them. They're sturdy and just the right size. I put them in a photo box on the shelf at eye level. I don't know about anyone else but I need to see my product to remember to use it. The magnets are strong and sturdy for holding your framelits in place instead of the double sided tape they come on. You can even cut them to size for smaller framelits for example. My upline asked if I wanted to split an order with her and I have used them all and just placed an order for myself. These are awesome. This is my second set. Love how they hold all my framelits and keep them secure! I've tried several different storage solutions -but this will be the one I stick with for good! Makes finding die cuts much easier and fast to find the one I'm looking for. These magnetic cards are AWSOME! Great quality and sturdy. I just ordered 20 more. Thanks! I bought the 5 X 7 size- they fit perfectly in the FridgeBinz drawers. They hold the dies securely, but are still easy to pull off to use. It's easy to flip through to find the die I want. I'm very happy. MAGNET CARDS ARE THE BEST! By day I run a law firm, by night I love to be creative and stamp! However, my supplies can get out of hand quickly. This makes life manageable. As promised! I love the magnetic cards! Over all I like the product but being picky I noticed that several of the cards were not cut cleanly and so they have a ragged edge that shows the card board under neath. I can actually see my dies, will use them more with easy access! Love these magnetic cards to store my wafer dies. Keeps things organized. I can now find my dies in half the time. Wish that I had found them earlier. Would definitely recommend them. The description on the magnets cards said they were strong magnets laminated on sturdy chipboard. What I got were average magnets on cardboard. I'm pretty disappointed. I have tried several storage systems for wafer thin dies. This, by far, is the best. I can see every die without opening a cd or dvd case. I can remove any die without having to slide it out of a clear envelope or pocket. The magnet's strength is just right for these types of dies. This product rocks! I love these for storing my dies. Great idea! Love the magnet cards!!! Huge space saver compared to the original packaging of the dies. On the pressboard side I was able to glue on the title of the dies from the original packaging and a picture of the dies from the catalog. Closer to being organized. Yay!! These are simply the best way to store dies. They hold firmly, yet dies are easy to remove. Love them! When I first opened the packages of these Magnet Cards I thought they were thinner than I expected but it didn't matter. The dies stick to them well and don't fall off. They save so much room and now all my dies are organized in a much better way. I love that I can actually see each die set without having to open the package to look. I highly recommend them and plan on buying more in the future. Shipping was super fast too! These magnet cards are the best thing for storing your thinlits and edgelit dies. I love the magnet cards for my framelits, thinlits and Nestabilities. They take up a lot less room than the DVD cases I was using before. They work perfectly for all my dies. Easy to access and easy to see. I liked them so much that I just ordered more! When I attach my thinlit dies to a magnet sheet, I like to put a sheet of white card stock on top of magnet sheet and then put thinlits on top of card stock, I just like the look of the white card stock, it makes everything look more crisp. Anyway, when I was organizing my thinlits, I grabbed a magnet sheet, put the white card stock on top and then my thinlits. To my surprise the thinlits fell off and I tried again, still wouldn't adhere to magnet sheet. When I looked at magnet sheet, I realized that I had picked up a different brand of magnet sheet, not the magnet sheet from Stamp-n-Storage. I picked up magnet sheet from Stamp-n-Storage, put white paper card stock on top of magnet and then thinlits dies and the thinlit dies stayed attached to magnet sheet. Absolutely love , love Stamp-n-Storage magnet sheets, these are the only ones I will order from now on!!! I am most definitely "stuck on magnet cards." This is my second order, and I cannot imagine a time without them. Oh, yes, I can! My dies were in their pouches, where I had to take them all out to see which one I wanted to use. With these magnet cards, I just flip through them, and all dies are right there for me to see. Love, love, love them. Order yours today! You won't be sorry. Don't forget their storage container! These cards are the answer to my organization needs for my dies. Now I can find exactly what I need when I need it without looking in multiple places. Just what I was looking for! Keeps my framelits in place and in view! These cards are very sturdy due to the board backing, which is great to adhere the die pattern. The magnet is very strong - holds the dies tight. You can't reproduce this sturdiness and magnetic strength. Its easier and cheaper to just buy these. Love this product for storing my dies. I have to keep ordering because I never seem to have enough. I really like these magnetic sheets! They have a strong cardboard backing which stands up in a box nicely. I have bought lots of these. I make a label for the top and type the number of pieces so I'll know if one has not been put back. These sheets keep dies from getting bent or lost. A good buy! I purchased the 6x7 cards and they were perfect! Now I can see what I have and not have to rummage around the original paper holders and lose pieces. This product is fabulous! I saved so much room going from storage in an entire drawer to this one box of magnet cards. I am a crafter who needs to grab it quickly and this product allows me easy access. I just love it. These are so handy & have kept me organized for several years. I label them with the name & number if dies in set & alphabetize for ready use. How did I EVER live without these?!! Love me some Magnet Cards! This is my second order of magnet cards and I love how easy and at my fingertips my thin dies are. A quick flip through my holder and I can easily get to what I need. A must have product!!! Love, love, love the large and small Magnet Cards - all of my thinlits and framelits are so well organized now in the medium Wafer Die Storage Box (with lid)!! Love the 5X 7 magnet cards for my medium storage box. Now all my dies are easy to find and all together in one spot. AWESOME PRODUCT!! I truly love these boards. They hold the dies very securely and when placed in the Stamp n storage box (which is made out of real wood) it holds a ton of dies in a small amount of space! Great, wear wonderfully, and much better than my DIY ones. Love having these together in the die-keeper box! StampNStorage is THE BEST company to work with. Thank you! I love these. Just the right size but if I need a smaller one I just cut it. I love these magnet cards. They are sturdy and easy to store. I like having my framelits and thinnest clear and easy to see. My framelits are all organized. I love them, my dies stay on even if I shake them they still stay on. I love these magnet cards. I bought the smaller size 5x7. Each card will hold one set of thinlits from Stampin'Up except for the Mini Treat Bag. Sometimes part of the thinlit hangs past the edge of the magnet card but because the magnet is so strong the thinlit stays in place. I don't like the labels that come with them. They are thin and flimsy. Wow!!! LOVE , LOVE, LOVE THEM!!!! I had been thinking about the magnet cards for a long time and finally got them. I don't know why I waited so long. They are wonderful. I would recommend them to everyone. So much easier to find what I want when I want it and really easy to put away. Love them !!!! The larger size magnetic cards are the best! I can fit my larger die cuts on them with no problem. And they even fit in the smaller storage box. The best magnetic cards ever! I have tried all types, even vent covers, and none worked as good as these. They are super strong and keep the dies where I place them on the card and don't fall off. Customer service is the best also. Highly recommend them for dies. I love these magnetic cards for my metal dies.. They hold them firm and I have never lost any of my small dies. I would recommend this product ,, it is the best. These magnet cards are just perfect for easy use of magnetic dies! I know I will use my dies more as they are more available and visible on these cards. While the quality seems good, the size is not accurate to main size choice. Exact sizes in the choice area would have prevented some shortages on this end when attaching my dies to your products. A bit deceptive! LOVE the strength of the magnet of these cards!!! These magnetic card are the best quality. The are strong magnets and thick cardboard. I have about for sets and my first is as good as my last. I am looking forward to adding more Stamp-nStorage to my collection. love your magnet card for my dies! I have tried different ways to hold my dies. I at one time bought special single layer books that were magnetized but they are not longer available. Then I tried magnet strips. When I saw your magnet cards, I knew I would like them, specially for the smaller die sets with smaller dies. and they work great. I place my dies on them, cut out the name of the die and place both inside a quart baggy and place them in a plastic holder. This has turned out to be the best solution by far for my wafer thin dies. The magnet boards are made so well Nothing falls off them. I will be purchasing more. I love the magnet cards! I love using the Magnet Cards. They are sturdy and work great. I store mine in an old sewing machine drawer and it's long enough to hold 2 rows of the Magnet Cards. I'm so glad to have this perfect solution to safe and easy storage for them. I absolutely love the organization the magnet cards create for me. It makes crafting more enjoyable with easy access and storage for an easy clean up. Thank you Stamp-n-Storage! The BEST way to organize your dies! 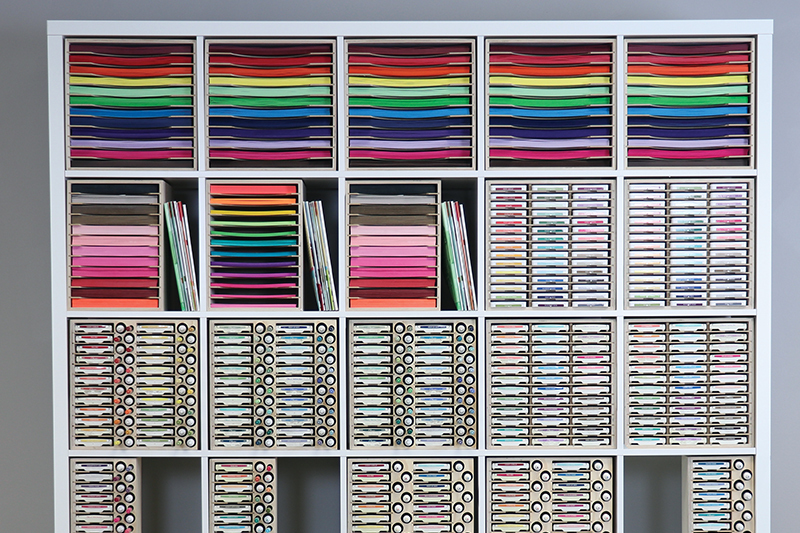 Want the BEST way to organize your dies? Order the Magnet Cards from Stamp-N-Storage and you're on your way to total die organization! They are perfect for all the thinlits I use. I especially like that they are two different sizes. This is my second order of them and I am very pleased. So far I've only opened and tried out one magnet, but I love it! Can hardly wait to get them all organized. I received my order quickly and in great shape. Thank you! Perfect system for framelit /thinlet storage. I purchased Stampin' Up clear stamp storage boxes. Your 5x7 magnet sheets fit perfectly inside for secure storage and filing. In the past, I have ordered the smaller size magnet cards. When I saw the special, I wanted to order the larger cards to properly fit my larger thinlits. I am very pleased with both sizes. It is so much easier when stamping and using my Big Shot, to be able to grab a card. After I use the die cut, I easily return it to the magnet card to prevent any damage or loss. I love Stamp-n-Storage. They are so efficient with sending your orders. Customer service couldn't be better! These are really great. They are thin and easy to use. The dies stay put on the cards and come off easily to use. Makes organizing my die cuts so easy. Second time I have ordered. These hold my dies firm. Easy to cut if needed. Service excellent! Love getting my dies on the magnetic boards--organizing at its best! So far, these are great! I have other magnetic "cards" from Art Bin - and they curled up so badly in the case that my wafer dies won't stick to them. These chipboard cards are straight and sturdy, and my dies are secure. Love them! I bought this set of cards to put coordinating dies for my stamps on. I plan on putting the stamps & dies in an Avery Elle clear pocket envelope together so they'll be w/n easy reach. I've been putting them together already but the dies always are @ the bottom & a few times the smaller dies have fallen out of the envelope. I'm hoping the magnet card will solve my problem & make it easier to find the die I'm looking for w/o having to dump them all out on my table:). Got them on sale. Had the shipment within a few days so great service. Am still working on sorting out my stuff but these will help me get organized for sure. The magnetic cards are wonderful, strong, perfect size. They securely hold my dies and are easy to access. Love, Love, Love them and will be back to purchase more. Best die storage product on the market today!!!! This is my third order and I have found the magnetic storage cards to work better than any other product!! I have tried many and can't say enough good things about them!! Buy Buy Buy!! I love these magnet cards. They are so handy. No more missing metal dies! Love, love these magnet cards. Now my dies are all organized with no worries about losing one. I am very very happy with my purchase except they sent me the smaller magnet cards instead of the 7 X 6 ones I ordered. They are great, though. This system works for me. I indexed my dies on these magnetic cards in categories: circles, borders, nature, objects, squares, words, etc. and they are easy to find. Keep the storage box within arm's reach of my workspace. Stamp-N-Storage's framelit storage is great - I have one wafer die storage unit with about 45 magnet cards in it (and room for more!). There is plenty of room to flip through and find what I need. I added labels at the top right of each magnet card with the name and number of dies in each set. Very happy with all my products from Stamp-N-Storage! I love these cards. All of my dies are organized and in one place and easily accessed. I bought these with my die storage box. As described, the magnet is laminated to chip board. They are a nice size to hold quite a few dies and are very sturdy. I have already purchased more. And they are shipped out super fast. These magnetic cards are perfect for holding the framelits, and thinlits. Much sturdier than the magnetic cards I've been using which are very flimsy. I will probably need more of these soon and will consider getting the storage box as well. After struggling for a good solution for Framelits dies and never quite succeeding, I decided to try SNS Magnetic Cards. Was definitely worth it. Will be ordering more! These magnet cards are the perfect size for organized storage of all my dies. I love that the cards are sturdy but not weighty since magnet material is often weighty to begin with.. And I have to mention how quickly I got my order, I think it was only 2 days after I placed my order! I'm very happy with the whole process. Thank you Stamp-n- storage, you've made me a loyal customer. I am very impressed with the magnet cards. They hole the thinlits and are much stronger than other products I have seen. Very strong magnets that work great for holding spellbinder dies. I have completely reorganized my die-cuts and embossing folders. The magnetic pads are strong and work with all my die-cuts. I may have to get more!!!! They are exactly as described. So happy with the cards. Allows immediate visual of my dies, and stores them safely. Will be buying more! It's such a pleasure to have all my framelits organized and in plain view when I need one of them. I have many and can just flip thru them to find the one I'm looking for. Not only is this a great product but great customer service! Magnet Cards are the best way to keep track of your framelits. This is my second order. Love these magnet cards for my metal dies. They are strong and hold securely. They make it easy to organize all my dies. 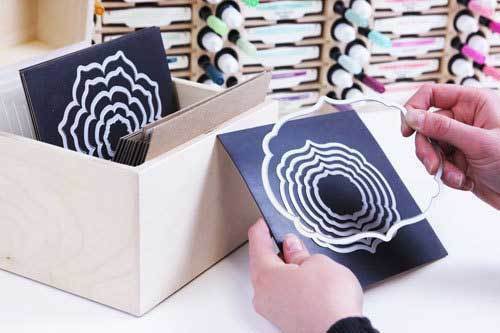 The magnetic cards are a fabulous way to store your wafer thin dies. They are strong & hold the dies securely. Used in conjunction with the storage box it's a very space saving & handy way of organizing your dies. I love them. Well-made, sturdy and the only solution that I've found that really works for a large collection. Just wish they were a bit less expensive. Love them. I need to order more! These have a super grip on them. A great way to store dies! I purchased the 20 pack of 5X7 and used them all. They were very easy to attach the dies and they fit just perfect. I also purchased a 10 pack of 6X7 for my larger dies. They work great for your really large dies. The 20 pack is the best deal. I am on my second batch of 40. These cards are so easy to work with and so much faster than purchasing the vent covers from the hardware stores and DIY. Everything is already done. You just add your die cuts. I have even decorated the cardboard on the back just for the heck of it. The quality of your products is top notch! I bought a 20 pack (totally underestimating my ability to hoard...er..collect wafer dies. ), so I'll be getting more. They keep my dies organized and take up much less space than some of the packaging. The only reason I dropped a star was because some of the chipboard sheets are cut a little longer than their magnets. But otherwise a simple, but brilliant product. I have tried several ways of storing my dies so they are neat, yet easily accessible. I love that I can flip through the cards and readily find just the die I am looking for. This is by far the best method I have found. I've been making my own magnetic cards for dies for years. It's nice to have a source that will allow me to same time. These magnetic cards are truly the best! 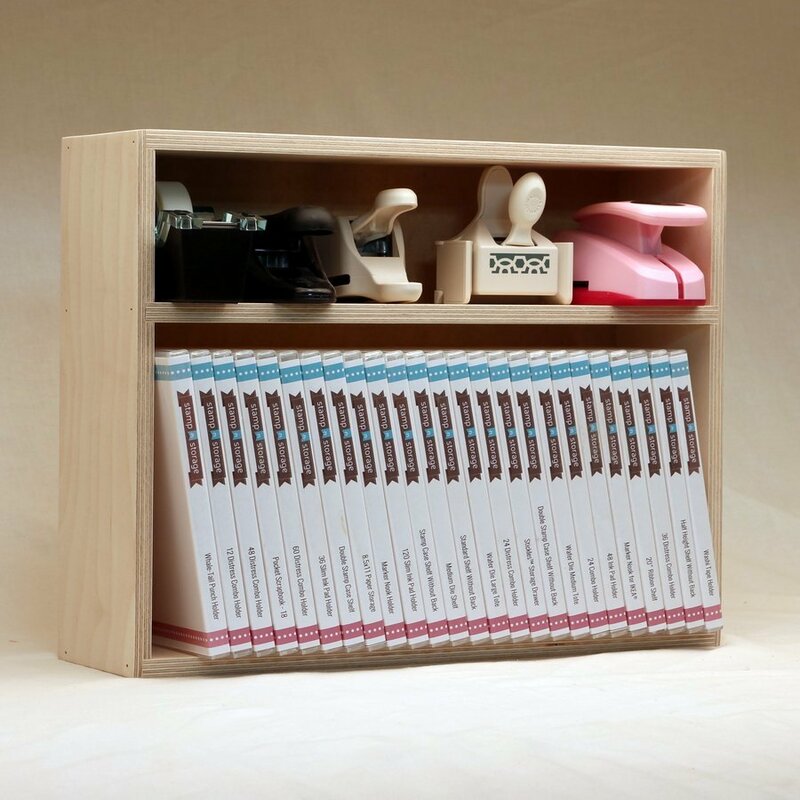 I have tried several ways to store my framelits in the past and this product is truly amazing. The grip is great, the size is perfect, and the quality is excellent! Now my framelits are so easy to flip through to find what I need. I've tried other magnet sheets for my dies and none of them worked well because they were too soft and bendable. As soon as the sheet would flex even a small amount, the dies would release. These magnet cards hold like iron and are stiff enough to stand up in a card box which makes for easy sorting and finding. I will be purchasing at least 2 more sets, and other Stamp and Storage products as well. I love the magnet cards. Have never seen or heard of this, but sure makes for easy picking and storage. Just the right size for my dies to fit on and to be put in an album. 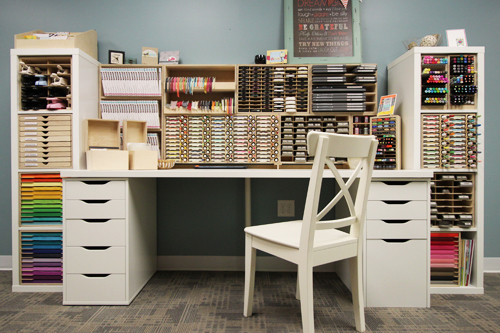 What a great idea you all had for die cut storage! Before, I had mine in CD holders and you couldn't keep them in place and the lids were constantly coming open and spilling the die cuts out. Now my die cuts stay perfectly in place . 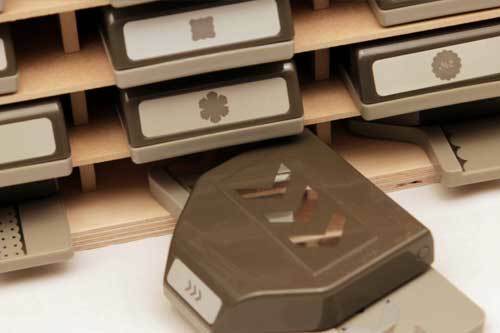 Leave it to Stamp N Storage for another great stamping storage idea! I love how you can use glue dots to adhere to the inside of the stamp case. This way you have every thing together when your ready to do a project. Thank you so much for coming up with these "cards"
great for storing dies - love this system! and hope to purchase more for my craft room soon. These magnet cards have simplified my life. So easy when they are on cards like this! Love 'em! ***** FIVE STARS! I had been using a magnet system that Joann Fabrics sells, but the cards while they were thick, they bended too much! Your cards are amazing and perfect! I do wish there were an even larger size however. I bought one package to try them out, then I had to get another because they were so helpful. I now got a large supply so as not to be without them. Greatest storage for dies known to man!!! The thin dies present their own storage challenge. The magnetic cards are a brilliant solution. They can be stored in smething as simle as a "shoe box", labeled and easily identfied by category. I attached the orignal card identifiing the dies on the back of each magnetc card for future ref. if needed. A great way to store dies and see them at the same time. I purchased these once before and loved them so I got more! Good product! I have bought magnetic vent covers for my dies and was always disappointed that the dies did not stay in place. Bought these and WOW they stay where I put them. Love, Love them. The Magnet Cards are Awesome!!!! I've been looking for something to hold my dies with; I've looked everywhere, till one day I seen a post from a lady on how she stored her dies and gave such a good sell on them, I had to look further, so it lead me to your website, and I seen the magnet cards first thing, I said I must have these. I have some dies that a little larger than my cards, so I am hoping you go larger with them, so that the Spellibinder Grand Dies will fit on them. I will be purchasing more I'm sure as my dies increase. Thanks so very much for making such a treasure to all us crafty people out here, needing storage ideas. I ordered the larger size and they were the perfect fit for my largest dies. Cut them down for smaller dies. The price is so affordable and I'm even using the pieces I cut off! Great buy! This is so much easier to work with using these magnet cards than in the package they came in. These are great! I love that they are nice and hard and can be store up right without the dies falling off. This is my 4 or 5th set of magnet cards, and I must say that I still am impressed with the how well these magnets hold my craft dies. They are like none of the other magnet systems I tried for die storage. The dies NEVER pop off of the cards, to remove the dies you must get your nail underneath the die to release it from the magnet. I had thin dies and no idea of how to safely store them so they did not get scratched or bent. The magnetic pads are fabulous. I am able to organize my dies safely, label the pads for easy identification, and simply put them in a box of my choosing. Easy to see, easy to access, easy to store. I love these magnet cards they are perfect for my die cuts and they hold the die cuts great. With the magnet cards my die cuts stay in place and not falling out of the container. I just ordered my friend a set she liked my set so much. Also the price is great. I ordered 10 of the magnetic boards to try for storage on my dies. They are Great!! I ordered 10 more!! Like so many people I wanted to put my framelit dies on magnet cards. I looked at hardware and craft stores and the magnets cost a lot of money for flimsy product. When I saw Stamp-n-Storage with their cardboard backing and heavy duty magnets I bought 2 different sizes for a total of 80 magnets. A wonderful product! These are great. Sturdy with really good hold. Combine these with the storage box and you can organize all of your dies and flip thru them like a card file . Your dies will not drop off the card since card does not flex. I put labels on the back of the card identifying the die and divided them into like groups. It's made life so much easier. I just received my magnets sheets, there the best. They keep your dies straight, they don't bend, they hold just right, but you can get you die out easy. They are the best. I really do like these. Keeps them in good shape and is much easier that other systems. I have mine in the Stampin Up storage cases for the clear stamps. I put two cards per case, back to back so I can see the dies. Any papers that came with the dies fit in the middle. The only "complaint" I have would be the way the product was shipped. The outer packaging doesn't hold up and most of mine were open. Also the backing has a lot of loose fibers (shreds of cardboard) that get all over everything. I love them. Easy to store and label. Great item. A must have. I have 20 now. I have quite a few metal dies. These are perfect for organizing them. Thanks! Love, them, love them, need to order more! These cards are the sturdiest I've found around and have strong magnet hold. I can stand them up in the die file box and search for the dies I want easily. I just ordered more sets for my new dies!! Loved, loved, loved this product! Love that they are sturdy! Work well for all of the dies! !the delivery was fast which was nice! These magnet cards are great. Framelits really cling, and the cards are made with heavyweight paper. Didn't know I wanted these until I bought them! Didn't know about these until I saw them on this website, I love them. So much more easier then having them taped to a card. Love it! Storing all my dies: Spellbinders, SU, etc. Very strong and easy to access. Thank you Stamp-n-Storage for this product!!! I'm glad I found these. Best way to organize your dies. Everything is neat and orderly. Using these cards to store my SU "Thinlit" dies. Unfortunately the magnetic card is just a little too tall to fit into the plastic sleeve provided by SU. Maybe these work differently for other products. I've tried other storage options for storing my dies: cases, binders and original packaging. What I like most about this design is its easy access to all my dies. The second thing I like are the dividing cards so I can easily organize my dies. My only draw back is I would like to have received more 5x7 magnets. 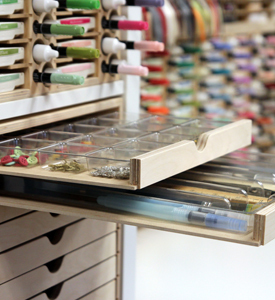 Overall, this is a great option for storing and organizing dies. Great product, fun to get my SU framelits & thinlits together! Love the free shipping!! The magnet cards are the perfect size for Framelits and Thinlits. I love the convenience off having them on a card instead of fishing them out of an envelope and then trying to get them off of the adhesive. The labels are a bit flimsy if you want to use them as tabs. The magnet cards as wonderful for storing dies on and then put into the box. Love them. BEST Die organizers out there! Truly the best way I have found for holding and organizing my dies. The sheets fit into a box and stay right at my Big Shots side for finding what I need quickly and I return them instantly so nothing gets lost. LOVE THEM!!! Love these cards for holding all of my dies. I keep them in a box and can flip through them easily without them bending and the dies falling off. Your magnet sheets are the best product to come along since the dies themselves. Excellent holding power. I just reordered! These sturdy magnet cards help keep your dies in order. Easy to slip through, this is the best solution to an otherwise difficult job of keeping them neat and handy. Perfect storage and organization of my wafer thin dies. I can flip through with ease and find the one I need. Organized dies, easy to find, and they don't fall off! Yay! Must have!! work great for my thinlits. I use a 5x7 loose sleeve notebook for storage. the magnet cards fit into each sleeve with the thinlits attached and they stay in place and not flop around. I was looking for a replacement item for the magnetic sheets Stampin' Up! used to carry. I'm happy that I finally found magnet cards that actually hold my framelits. Disappointed that they don't have adhesive backs. I love these magnetic cards. This was my second order. It is so nice to be able to put the dies on and not fight with the tape/card they come on. I knew if Mary Fish recommends your products, I would love them. Excellent way to store your dies. The Magnet Cards are strong and stand up in a box great. Makes it so easy to find the right die you are looking for. Finally, a product that isn't flimsy and holds a suite of dies! The magnetic die cards make it so easy! Will definitely be ordering more. The magnet cards are wonderful for framelit and thinlit storage. I put a label at the top and store them alphabetically. Nothing better for ease of seeing my framelits and thinlits and being able to get to exactly what I need quickly and easily. This organizes my dies perfectly. I'm happy with your magnetic cards and happy to have all my dies in one place. Thank you, Stamp N Storage. i am finally able to organize my dies thanks to the magnet cards. i have tried to use magnet rolls/sheets before cutting them down to fit the dies ....they were so flimsy the dies would fall off. ...more trouble than its worth. love love love this product:) this company also has great customer service. Great product but the shipping is not good. My package came so badly damaged....I ordered 40 .... I was surprised they made it. Some corner damage but the company replaced those. I would rate them 8/10 because of the packaging. For that many they should have been in a box instead of a heavy paper envelope! I have tried many other magnets but these do the job, strong hold. I love the 2 sizes, was disappointed in the so called dividers as they are just chipboard with no tabs, easily fixable but I was hoping for something ready to use. The star is the magnet sheets however and I am very pleased. The fact that they are a faith based Christian Company made me exceedingly happy. I will be ordering more items. This is my 2nd order of these Magnet Cards, because I seriously love them! The magnet sheet itself is strong and holds my thinlet dies exactly where I put them, and after adding a label to the top of them and storing them alphabetically, I can flip through them to find just the set I want with quick ease! All of the Stampin-N-Storage products I have bought is amazing, and customer service is 5 Star! These magnet cards are perfect for my needs. I bought the largest size 6x7 and placed a simple tab label at the top to identify the die. The magnet surface holds many dies and sets. I tape a sample on the back if the die is difficult to read so I know what it is. Perfect! These magnetic sheets are perfect for organizing your dies. I did have to cut off abt 1/2 inch off the top so they would fit into the plastic envies to store them again. But very easy to cut. Being super organized I was thrilled to find these magnets! Having the box and these just saves time. No more trying to sort through a stack or book. Love these! These cards are strong and sturdy and accommodate even the largest of Stampin' Up's framelits and thinlits. It's easy to flip through them and find the exact die you are looking for without opening and closing plastic cases or envelopes. After trying a different magnet solution from another company, I find that Stampin' Storage magnet cards are hands down the best! I am so happy with them I ordered 3 more packs of them! Outstanding thinlits storage boards arrive. Love my magnetic Storage boards, makes them so easy and conveniently to find and store. Will definitely be purchasing more. I am super happy with these magnet cards. I bought the small size, which are perfect for most of my Stampin' Up! framelits and thinlits. I have a couple of bigger sets (the envelope liners and circle card thinlet) that don't fit on those; so I will be ordering a set of the bigger ones. I made chip board dividers with labels to go behind each magnet card. I feel very organized now!!!! My wafer die collection is now at my fingertips...so easy to retrieve a die. And no more lost dies, as I was not always good at putting them back in their plastic envelopes. Now, I can almost drop it on the magnet card and it won't get lost. Another great product from Stamp N Storage!! I have purchased other magnet sheets that did NOT hold up very well, but these KEEP THE DIES STUCK! Very good product. Was out of town when I ordered them. Wish I had my actual dies with me. Cards are about 1/2" larger than envelope from SU and really thick, so cutting them down a little to fit is questionable. The mailing envelope was really torn up when it arrived, but the items inside were in great shape. Gonna figure out a way to use them in my SU envelopes! I'd say they were worth it, just wish they were a little smaller. I love how all my Framelits & Thinlits are all neatly on these Magnet cards. I no longer have to fuss with getting them out of the case they came in. Love this product. Heavy Duty magnet boards hold dies down, easy "flip through with fingers" when in containers and dies remain on magnet board!!! Great product, terrible packaging for shipment. I decided to purchase these magnet cards to organize my dies,. I order forty (40) of them. Whoever packaged these for shipment just threw them in a box and mailed them. I was lucky to get my order because the box arrived falling apart. These magnetic sheets work great in Stampin Up stamp cases. They are easy to cut to size if you need them smaller. Only concern was that they were cardboard backed. I used red tape to stick them to the stamp cases. I have some concern that cardboard may separate from magnet at some time in the future. This is the only reason for 4 rating. I have purchased OTHER magnet storage sheets and these are by far the best I have had. I ordered more after the first ones arrived. They are a good choice! These work very well, just the right size and weight. Shipping less than perfect, Priority Mail envelope very damaged, however, magnetic sheets somehow made it through unscathed . I'll order more soon. Excited to see storage made specially for our Stamping supplies. Wonderful workmanship. Best storage for all dies! With this system all your dies can be in reach as you work. Magnets hold dies, no more slipping. I have close to 200 now, and yes I have this many dies! Love them. I LOVE the magnet cards for my thin dies!! O.M.G. PERFECT storage solution!! Very strong "cling" to them. Fast delivery. Thank you! The Magnetic sheets are awesome. However, they came in a "priority envelope" and it was almost in shreds. Places where it was not taped were torn. A few of the "cardboard" dividers were bend. Would have liked to have seen this come in a "box" as opposed to a thin envelope given the weight of the sheets(40). I live that I can just set them on the magnet cards. Trying to get them off the paper they came on then stick them back on was always labor intensive. So glad I saw these. I've tried so many other methods of storing and organizing my dies and framelits, but Magnet Cards are the best and only solution for me. They're sturdy, the magnet sheet itself has a superior hold and the cards are large enough to accommodate every single die set I own. Their slim profile makes flipping through them a breeze and they're perfectly priced. I'll never store/organize my dies any other way. Love this storage system. It makes finding your dies so much easier. The die box is very well made. These brilliant inventions have me using my Big Shot die-cutting machine more often than ever before. I can find what I want, pull the whole card of Framelits to the die-cutting area, and put them away in less time. I use them at classes and workshops to corral the Framelit without losing those tiny pieces. Being able to see the Framelits on the card has made it easy to choose which one to die cut a sentiment or layer for my projects, too! That was never possible in the original plastic envelope Framelits are sold in. Love the magnet cards! They are very strong and I highly recommend them. I really love these Magnet Cards they are thicker and more durable than any other ones I have found. And they fit the Stampiin Up stamp cases perfectly. I have tried so many different storage ideas, all of them were hopeless. Magnet cards are Awesome. I can write the Manufacturer and name of the die on the back and then the dies are stored securely on the front. So easy to flip through. I liked this product so much that I just bought another bundle of 20 and the Wafer Die Storage Box to store them in. It feels so good to have them stored and organized permanently. Thank You Stamp and Storage for great products. I ordered this to put my metal dies for card making. I have totally organized them. Fanatic product, will be buy more. Also my card making friends are also going to buy them. I was having a real challenge with the Framelits & Thinlits in their plastic cases. I ordered the Magnet Cards and labeled each with my P-Tab and wallah. Easy to find and easy to keep up with. Having the cardboard on the back keeps them from grabbing on to each other. I highly recommend. I have tried many magnetic sheets, and these are by far the best! Thank you. I am so glad that I found this and your company on the Internet. I had been looking to create something similar to this but I could not get the magnetic trip that I purchased to hold my thinlits and edgelits. Also, I have saved space, and it is much more organized to see which one I need at a glance. Price is also reasonable. These are worth having. They make storing and organization a snap. I have bought three packages already! I was so excited to receive my Magnet cards. I opened them and set them up immediately. I can't believe what a difference from my old messy method. The cards are surprisingly sturdy. I need more now! I had tons of dies and wasn't using them. I saw an ad on Splitcoaststampers for the magnetic dies. I ordered some and fell in love. My dies are now in a file box organized by manufacturer and style. I use them all the time now. It is so easy to find just what I need. These Magnetic Cards are fantastic. They are so strong, mounted on hard cardboard, you can pick off a die without the cardboard bending, causing the other dies to pop off too. I have tried other magnets, not even on cardboard, in the past which were a total waste of money. These are very well priced. Good Job! I was a little skeptical about ordering these, but after receiving them they are great! I love them. Will need to order more! I purchased these cards for storage of my metal dies. The size is perfect, the 5 x 7 size fits in a shoe box storage container. Pricey for the magnet sheet glued to cardboard. Looking forward to trying some of the other products. Keeps your metal "cutting" pieces in order with no risk of loss or damage. The magnet cards are great, I love using them to store my die cuts that have a lot of small pieces with them, for some reason I am alway losing one of the smaller pieces, with the magnet cards they all stay together. Love them! Having trued many duffereng organizational methids fir mh craft dues, I have finally found THE perfect solution. All dies are 'filed' and can be easily located. The only thing better would be a system of tabbed dividers to go with...made my own. So now when I want to use the leaf die , I look behind the foilage tab divider and there it is!!!! This is such an quick, easy, accessible way to store dies. Cut down on the bulk and fumbling with all those little envelopes! I love these cards, they work a treat and I do not have my dies falling off which is fabulous, I would recommend them to everyone. Perfect for storing the delicate framelits & thinlits. Tried lots of ways to store them but this is best yet. Sturdy; magnet holds them well. You won't be disappointed. Great way to store your dies!! It is so easy to have all my framelits in one box. I added a label at the top of each sheet and store them in alphabetical order. These cards are perfect for what I needed to organize my dies. I couldn't be happier with them. Very high quality. Finally! No more fishing out of those plastic envelopes. No more tangled framelits. No more piling up those plastic envelopes that slip and slide everywhere! Thank you for those magnetic cards!!! Wahoo! These are absolutely perfect for my Stampin' Up framelits dies. Couldn't be more pleased with this purchase. I recently purchased the magnet cards and wooden storage box for my thinlet dies. They are sturdy and a wonderful way to organize these. I printed labels for each one and then put the number of dies on the folder. This a must-have for serious papercrafter. Excellent quality. I love these! It is such a great way to store your die cuts. Wish I would have known about these sooner. Great storage solution and fit nicely in my CTMH small boxes. Shipping is fast and customer service is the best. I have tried a lot of different ways to store my steel dies and this is y far the best!!!! Thank you for a great product!!!! I love my magnetic cards to organize my framelits. I can attach a label, organize them and find them so easily!! Love these magnets on the sturdy boards to store my dies!! The BEST system I have found! These magnet cards are the absolute best. The magnet is strong and the added wood support creates a very sturdy product. I was at home in the midst of organizing and needed additional magnet cards. I placed the order online and there was a box where you could leave a note. I asked if they could ship it out that day and they did! I had the items the next day. You just don't get customer service like this anymore! I just can't say enough about their product AND customer service!!! I saw these magnetic sheets on a favorite blog I follow and I decided this was what I needed to organize my growing collections of framelits. I was not dissapointed! They are perfect and for the first time I can easlily find what I need for my stamping projects! These magnets are absolutely wonderful. Great invention. No more opening & closing cases plus a space saver. FAST delivery. The best part was your concern for my soul. . Thank you Stamp-n-Storage. I've had die sprangling all over the place trying to find a good way to store them. I've lost some pieces of sets and some have gotten bent. These magnetic sheets are the greatest, neatest, safest way to store dies. I got just one set and now I want to get more. i like the idea of keeping them upright in a box, too. Now I know what dies I have and I want more sheets! The Best Magnets Ever ! After years of trying to figure out a way to store my framelits and other metal dies, Stamp n Storage has come up with a winner! These magnet cards are very well made. They have a hard backing and the magnets are super strong! It's so great to be able to just flip through each one. I find what I need quickly and without having to open a package. I labeled each one at the top for easy identification! Works great! So nice to get my framelits out of their plastic envelopes. Easy to find the one I want rather than having to pull them out. I know the system will make using them a real pleasure! I just received 40 of the 6x7 magnetic cards and put all of my dies on them . They hold them securely but are easy to remove. I was worried about bending them when I removed them from the double stick tape they came with. I will now need to order the storage box for them. I Love the Magnet Cards for storing my framelit dies. I was running out of room using the original plastic envelopes that they come in, and dreaded the thought of one more bin on my work table. Just like magic, they all fit in the bin that I was already using with room to spare! It is also so much easier to flip through and find what I need. This will be a great time-saver when prepping for my classes and workshops! I absolutely love my Big Shot, but couldn't use the Framelits very easily until these Magnetic Cards came along. Now I can be the speedy stamper AND have all my Framelits on the Big Shot table at the same time. Saves space, speeds up my die cutting, and makes me want to use them all the time now. And, I can see right away when one of the Framelits has been left out, or dropped. No more lost inventory! These magnet cards are wonderful and a great way to organize my wafer thin dies. I recently purchased a second set and now have all of my dies converted to these boards. I have condensed the space needed for storage as well by using the Die Storage Tote with them. Love them both! The magnet cards are very sturdy and hold the framelits perfectly. I love them! The magnet is strong. I was able to put about 3 smaller dies on 1 magnetic square. Also, I taped the die package picture that comes with the die, to the back side which is not magnetic. That way I know the manufacturer & part number & what it is supposed to look like. Just as I hoped, the magnet cards were going to hold my thinlits down better than the magnet sheets I was using. I was right and really like them. I did have to clean off the bits of cardboard scraps from one of the four sides of the card. All in all they will be a help to the metal thinlit investment dies. I've tried several storage solutions for my Thinlits and Framelits and these are by far the best! Sturdy, easy to store, and are large enough to store the complete set on one board. Amazing size and strength. I can fit each collection of dies on one magnet. I use both the Magnet Sheets and Die Storage Boxes for organizing and storing all my framelits dies. So easy to flip through and find what you need. I add my own labels for quick alphabetical access. I was considering several different methods for storing my steel dies. I ordered a pack of 10 of these to see if I liked them, and I’m glad I did. My dies are securely held into place on this magnet cards and I’m able to neatly store and organize them. And to top it off, excellent customer service from this company. I live in Canada and shipping was prompt and reasonably priced. I will be placing an order for more of these so I can organize the rest of my steel dies! The magnetic cards keep the dies organized and easier to locate. They also reduce the space needed to store all my dies. These magnetic sheets are great quality and really hold up. Excellent value. I have tried many different storage methods for my collection of dies and have found these cardboard backed magnet sheet to be the best! Easy to set up, easy to use. Wow - these are the greatest. While I was dis\appointed with the storage tote with the lid, I can't say good enough about the magnet cards. They really are the best I have seen. I have tried multiple die storage solutions, including other magnetic cards. Those cards failed, with my dies falling into a jumbled mess. Your cards are sturdy and the dies NEVER slip. Wish I had tried them first - I LOVE them!! Magnetic Cards are the Best! Love using the cards , makes storing and using my framelits so much easier! I tried several options for storing the dies and these are by far the best solution. Love them. Best Magnet For Wafer Dies Ever!!! I tried all kinds of different ways to store my dies - even made some card pockets to hold them. These are the best way I have found yet and well worth the money. I wish I had just started out with these to begin with instead of wasting my time trying other things. These are perfect for storing my dies. I even trimmed some to fit the dies back into their folder. Perfect! These Magnet Cards are the best investment I've made...I took all my dies that I had in CD/DVD cases and put them on these cards, what a difference it made in saving space. Not to mention that I can just flip thru my dies now without opening a case and all that goes with that. The only additions I made were that I bought some white Contact paper and applied it to each card, what a difference it made for me in seeing the dies, the black background was my only problem. Then I made some plastic dividers a little taller than the cards and divided my dies up into groups, like Borders, Shapes, Christmas, Circles, etc. Again I have to say it, this was the best investment I've made in Organizing my crafts supplies in years. I love these magnetic cards for storing all my wafer dies! Like others, I have searched all over for a system that keeps everything in it's place, easily seen, and easily accessible--search over, I've found it! The slanted storage box makes it simple to find the one I want. I would like to see larger ones, but for most dies these are perfect. The magnet cards make it easy to see what you have, and use them. I use the chalkboard marker to identify each die set. This is the best thing and they are the best thing since night baseball just get them. These magnet sheets work like a dream for most dies, however for the large sets of graduated dies (circles, squares etc,) the dies tend to fall easily. I just add a little tape. These magnet cards are great for almost all of my dies. Biggest problem is that the largest (6x7) are not long enough for the Edgabilities - bummer! Even placing them on a slant they fit over the edge. I only have a few of these longer dies, and for all the other sizes I have they are perfect. I searched all over for a way to store my dies, and then I saw these on your website!! I made some of my own from magnetic vent covers, and reinforced with chipboard. What a waste of time and money!! I love yours. They are the best!! I've ordered 130 of them! !